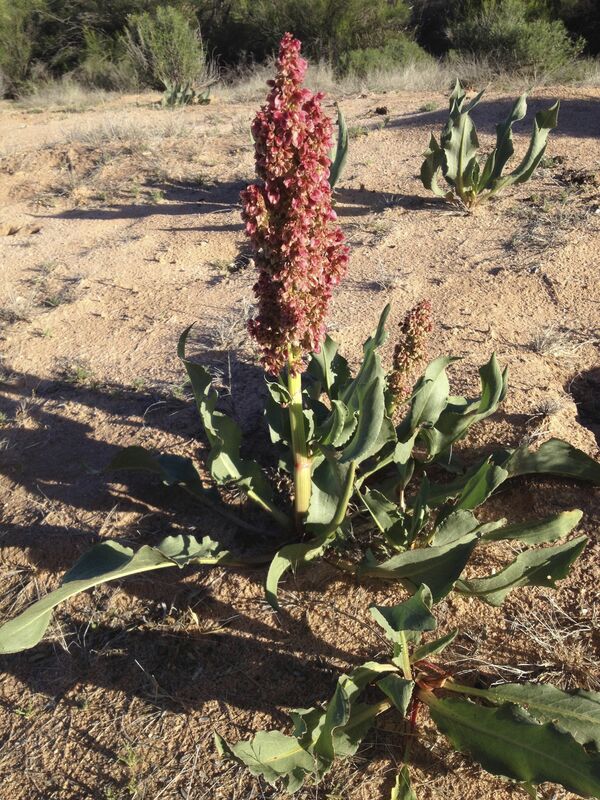 Known as hiwidchuls by traditional Tohono O’odham harvesters, canagria (literally “sour cane”) by Spanish-speaking amigos, Rumex hymenosepalus by science nerds, Arizona dock by herbalists, and wild rhubarb by those who might know its relatives in northern climes, this rarely-seen tuberous perennial has responded gloriously to our winter rainfall. 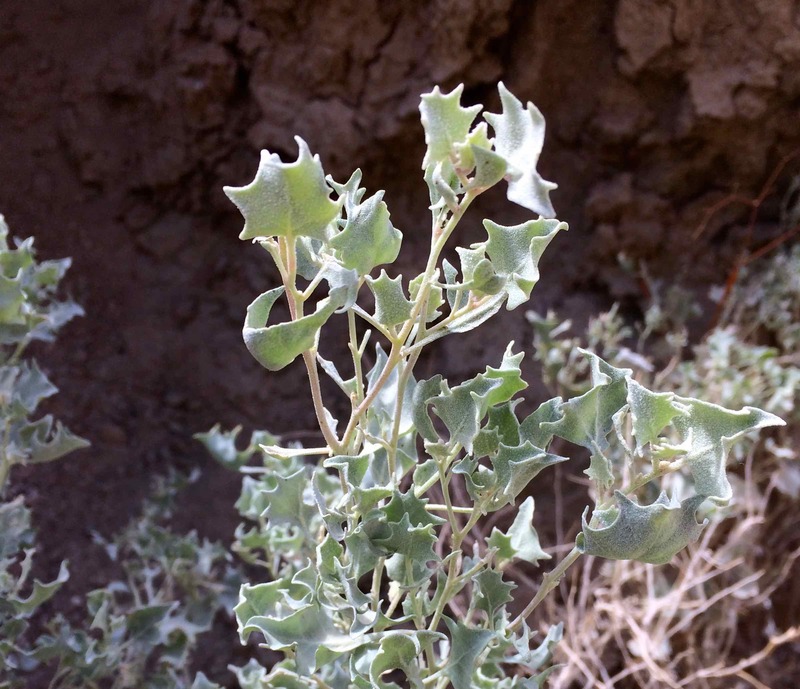 It is currently bedecking the riverbanks along the Pantano, Rillito and Santa Cruz where Native People have gathered it probably for millennia. But it won’t be there for long–so act now if you want a tangy-sweet treat! Wild rhubarb leaves can be boiled twice to eat as greens. 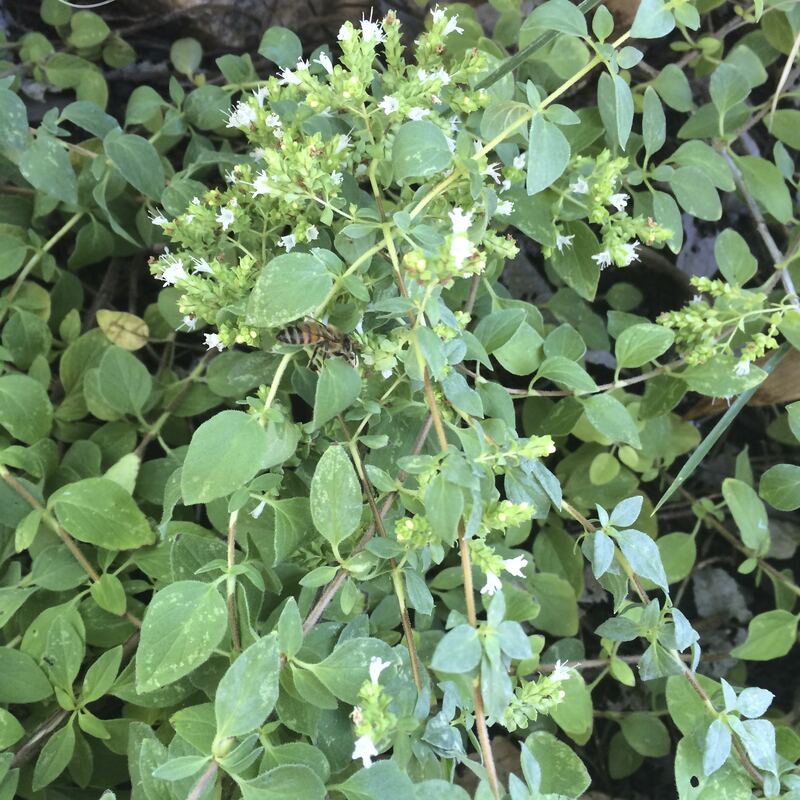 The plant also has many important uses other than food–tannins for medicine, dye from its root, and food for a native butterfly. Read more about hiwidchuls in my February 2017 savor-post using rhubarb as the keyword in the SearchBox above. I’ve used other ingredients in this recipe from our Baja Arizona palette of delicious heirlooms to make it super-local. 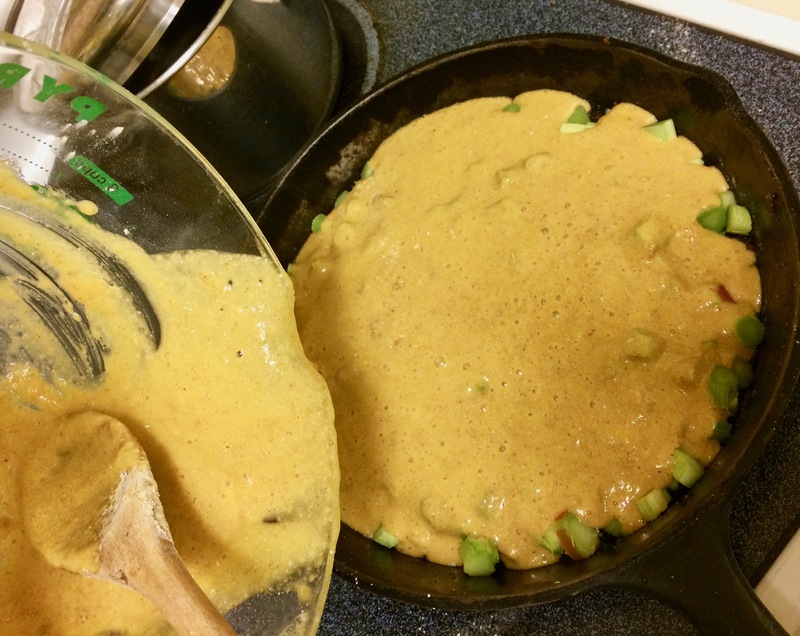 Into an iron skillet, melt 1/4 – 1/2 cup butter. 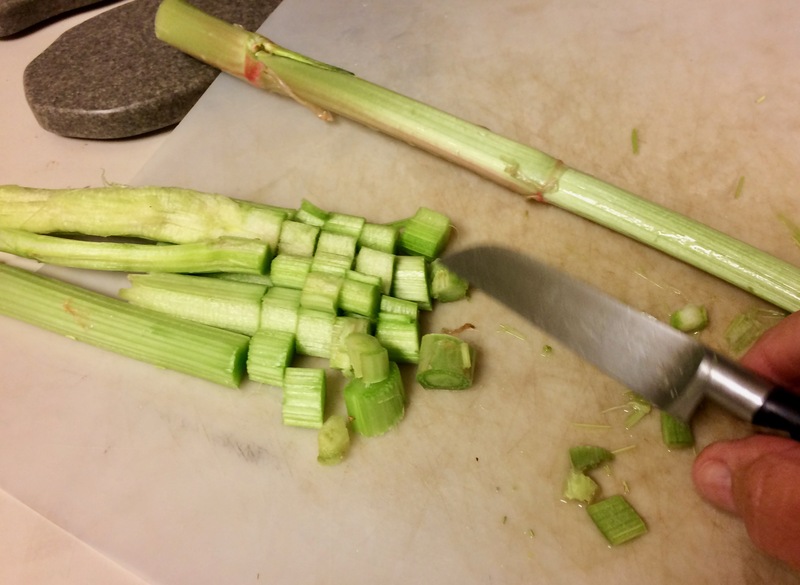 Place diced wild rhubarb on top of butter/sugar mixture (as in photos above). Separate 4 eggs, yokes from whites to beat separately. Beat egg whites gradually with 1 cup sugar and whip until stiff. Add 1 Tbsp melted butter and 1 tsp vanilla to beaten egg yokes. 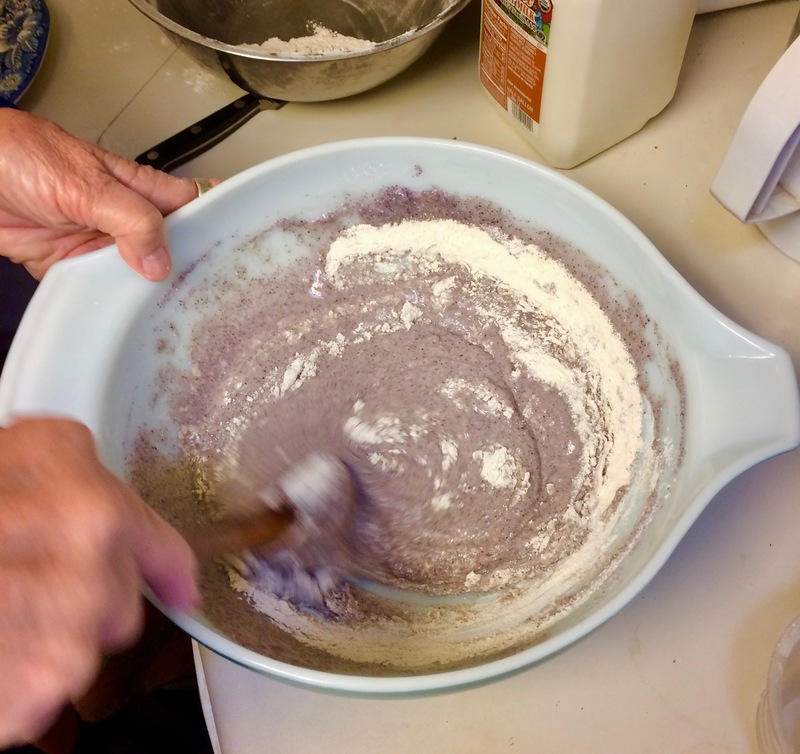 Fold egg yoke and whites mixture together then gradually add sifted flour mixture. 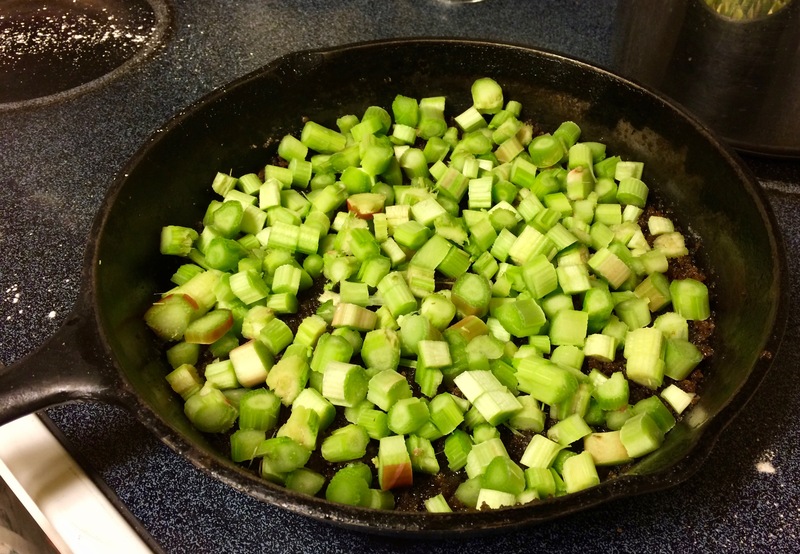 Pour batter over the still warm or hot rhubarb in skillet. Bake about 30 minutes or until it tests done. To serve right away, place a pizza pan or plate on top of the skillet bottom side up, then carefully turn the paired pans over. 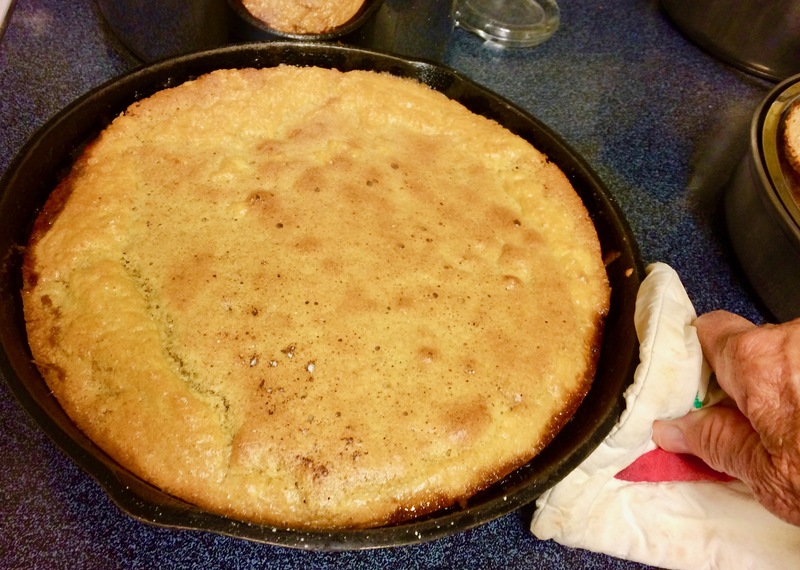 Your warm cake will drop easily onto the inverted (now right-side-up) plate. Remove the skillet carefully. To gild the lily, you can garnish your cake top with whipped cream. 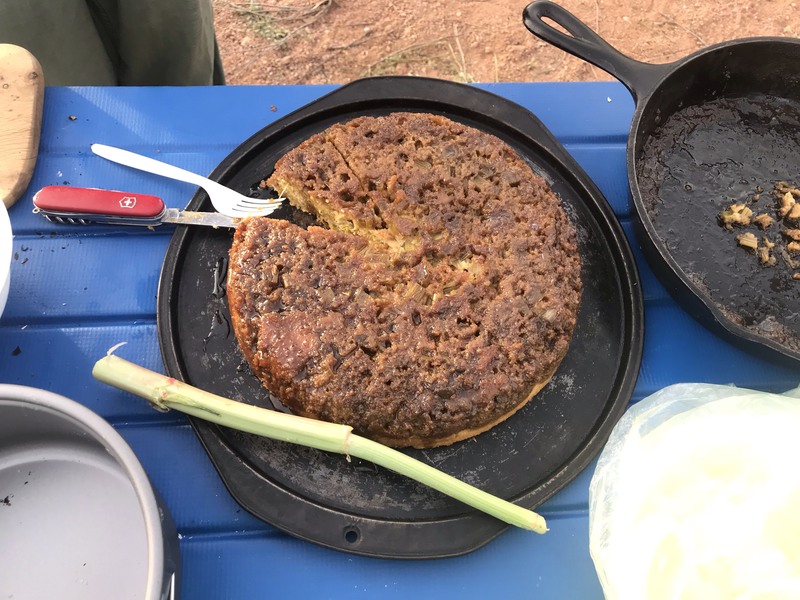 Enjoy the zippy tang and good nutrition of a wild rhubarb upside-down-cake made with our special heirloom wheat, mesquite, and amaranth! 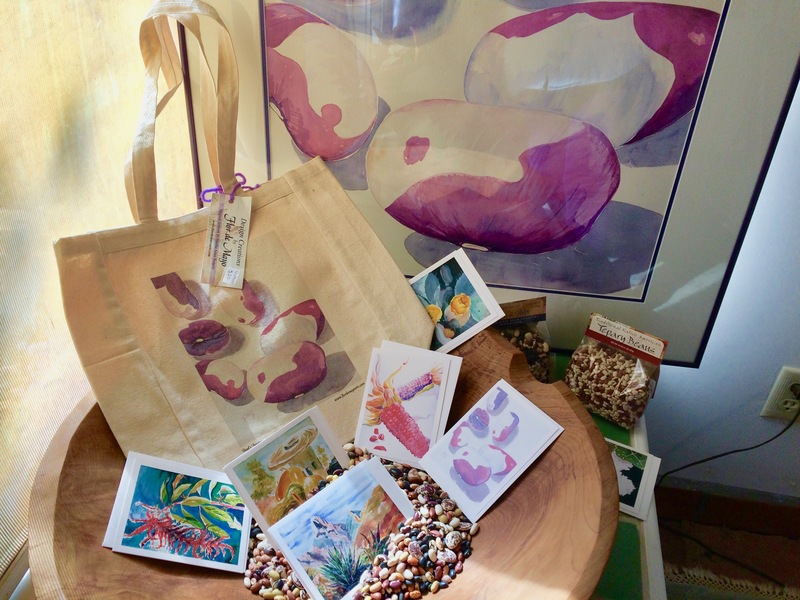 For access to heirloom products and artwork of heirlooms from Flor de Mayo, check out NativeSeeds/SEARCH store and catalog, and museum shops at Tucson Presidio, Old Town Artisans, and Tohono Chul Park. And visit my website http://www.flordemayoarts.com. 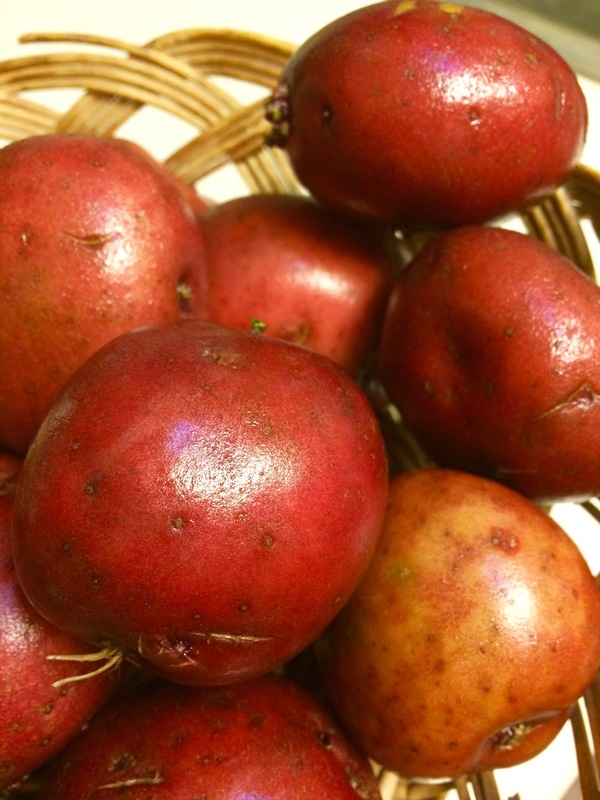 (Enter your favorite native food word and find great recipes at this very blog–search box at top right.) Enjoy every bite of flavor with gifts from our beloved Sonoran Desert! 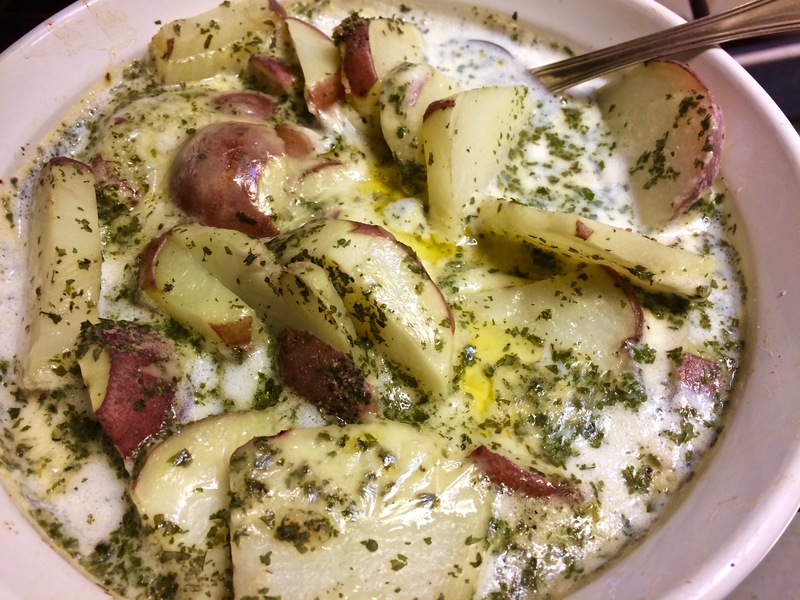 Tia Marta here to share one of our family’s traditional Christmas brunch favorites…. Don’t wait! 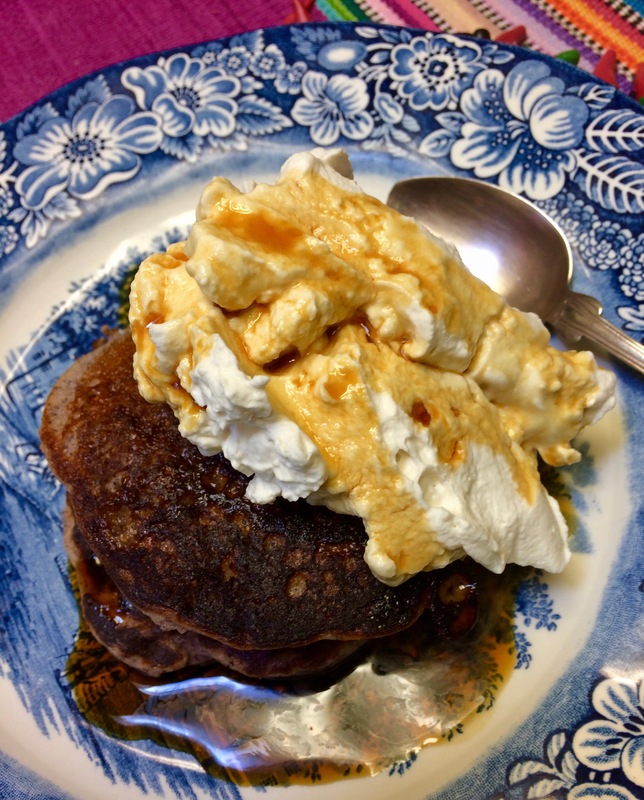 Serve hot bluecorn pancakes right away. Have your toppings (found locally or home-made from desert cactus fruits or mesquite pods) on the table ready for guests to custom-decorate each pancake stack. 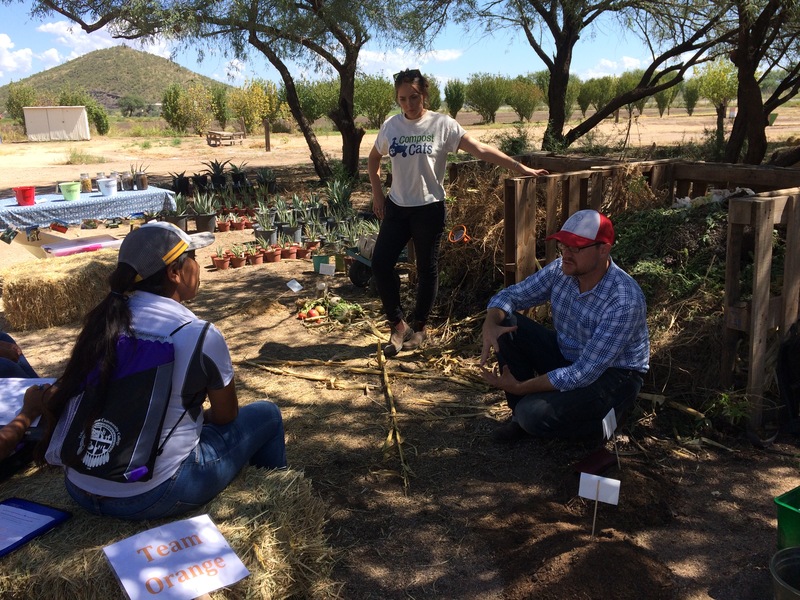 Then taste the joy and nutrition of farm and wild desert bounty! 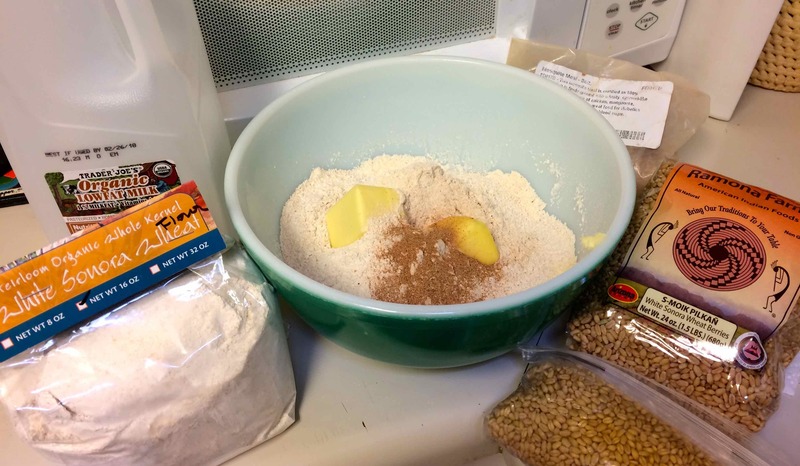 After mixing wet ingredients, quick-beat in your gluten-free flour…. 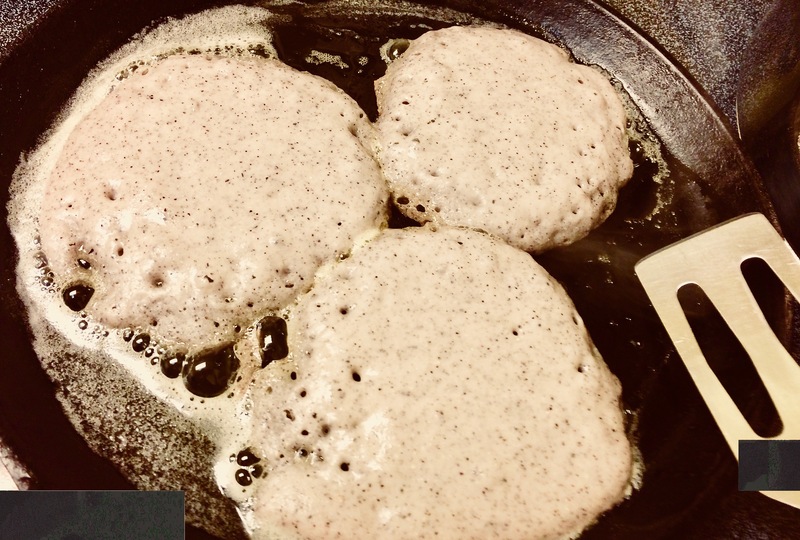 Pancakes on the hot griddle are getting done through and ready to turn when batter bubbles begin to stay open…. As Rod was helping me in the kitchen by whipping the cream he splashed a little libation into one batch. I must admit the Kahlua cafe liqueur gives the whipped cream a festive kick. For the hard-core among us we might go so far as lacing another batch of whipped cream with a crushed chiltepin pepper. 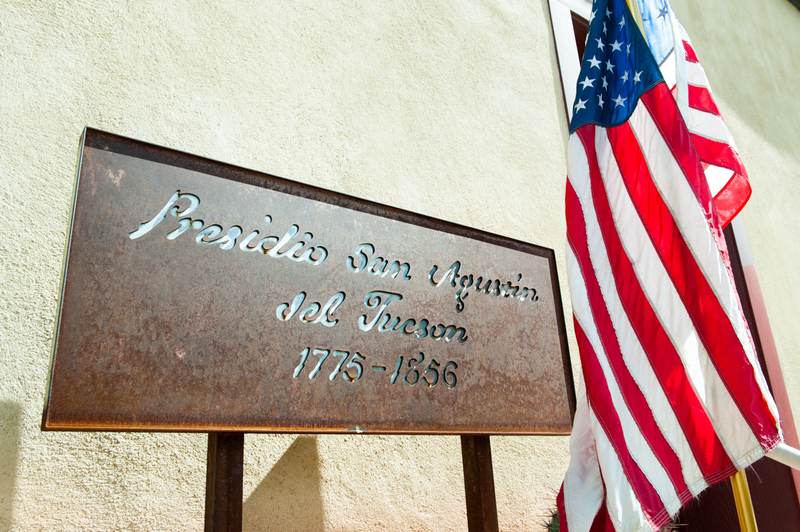 You can find fabulous local raw honey and precious saguaro syrup at San Xavier Farm Coop at 8100 S. Oidag Wog on the Tohono O’odham Nation near San Xavier Mission. 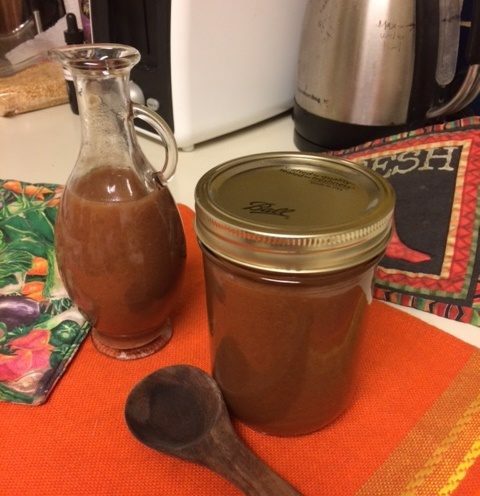 Honey from Fred Terry the Singing Beekeeper at Sunday’s Rillito Farmers Market is also superb, as is our SavorSister Monica King’s honey. 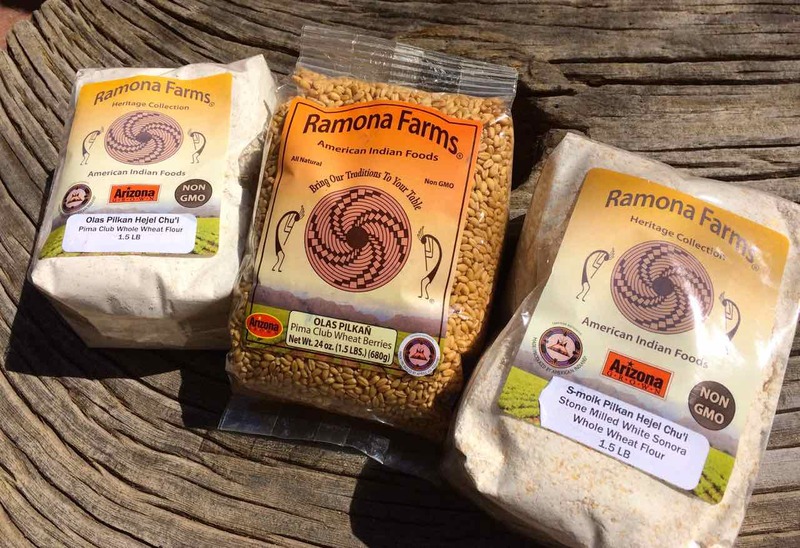 Native American-grown blue cornmeal is available at the NativeSeedsSEARCH store, 3061 N.Campbell Ave, Tucson, or online at www.nativeseeds.org (the perfect place for holiday shopping!) 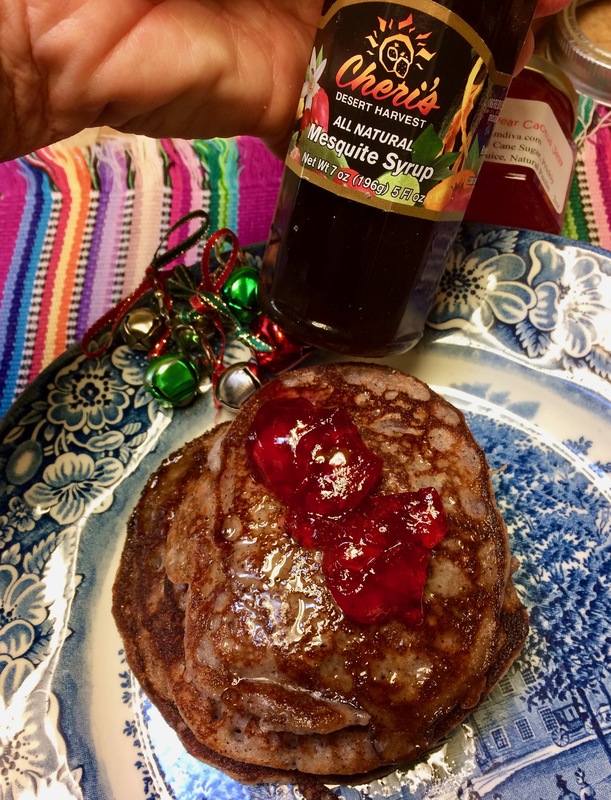 Cheri’s Desert Harvest products (like her mesquite syrup in photo) are there at the NSS store and at several specialty shops in Arizona. 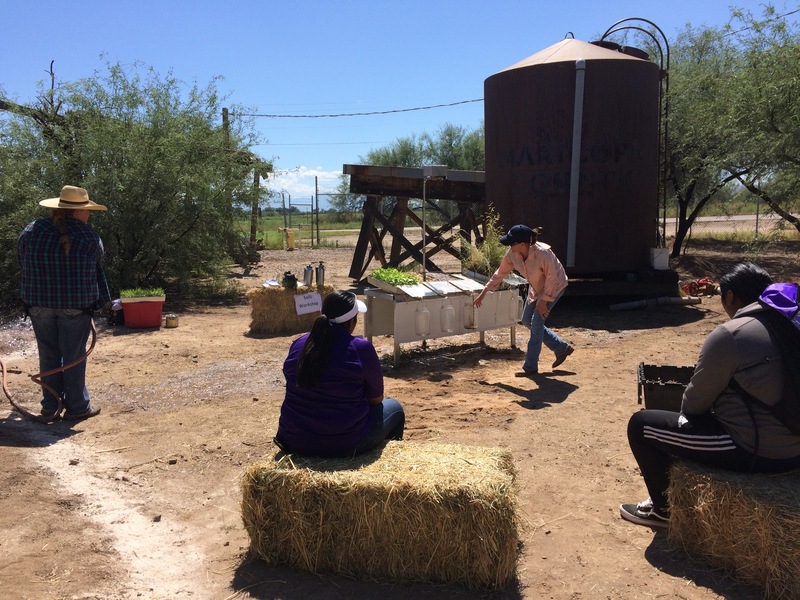 Great local foods–such as home-made prickly pear jam–are a part of the delectable menu at Coyote Pause Cafe near Tucson Estates. 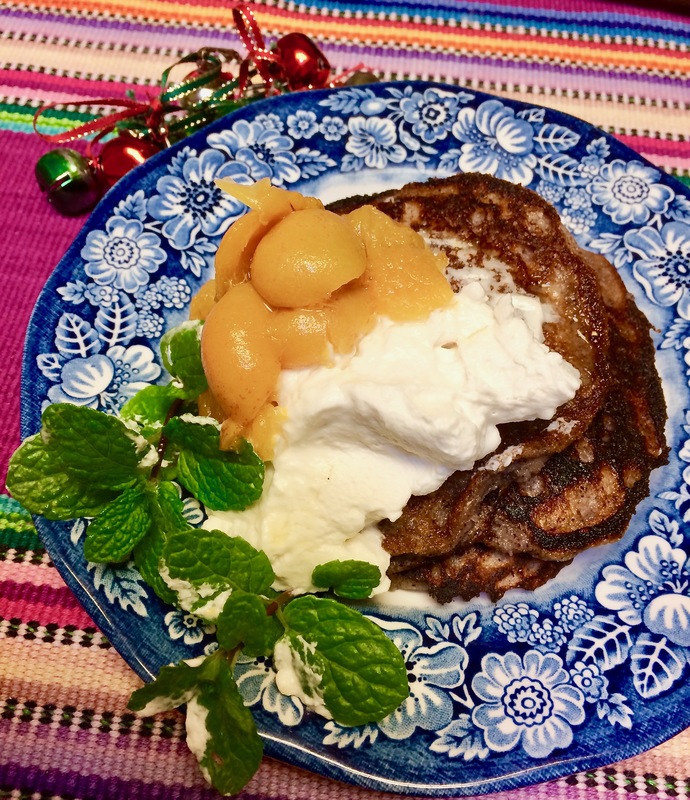 Dress up a holiday breakfast to delight the eye and tastebuds–fit for all at your table–with nutritious, LOCALLY-sourced Southwest gluten-free pancakes! 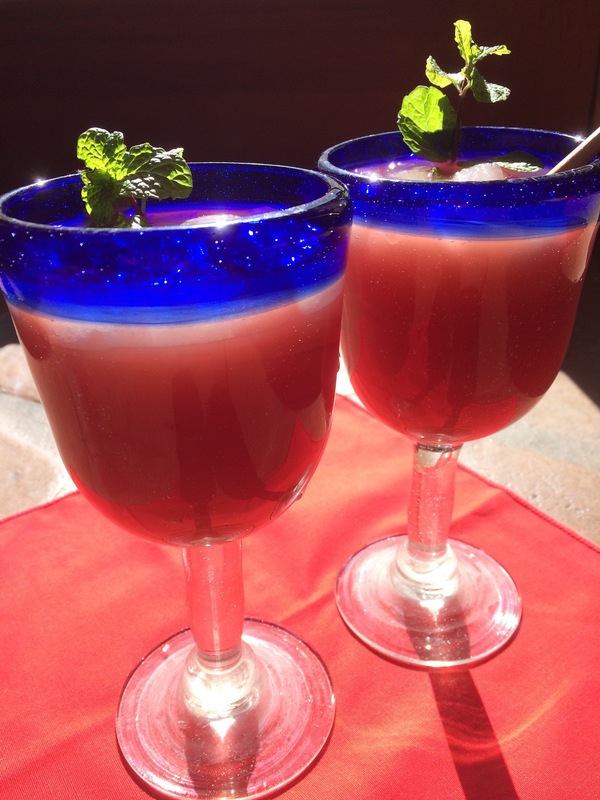 Ideas offered with cheers and holiday blessings from Tia Marta! 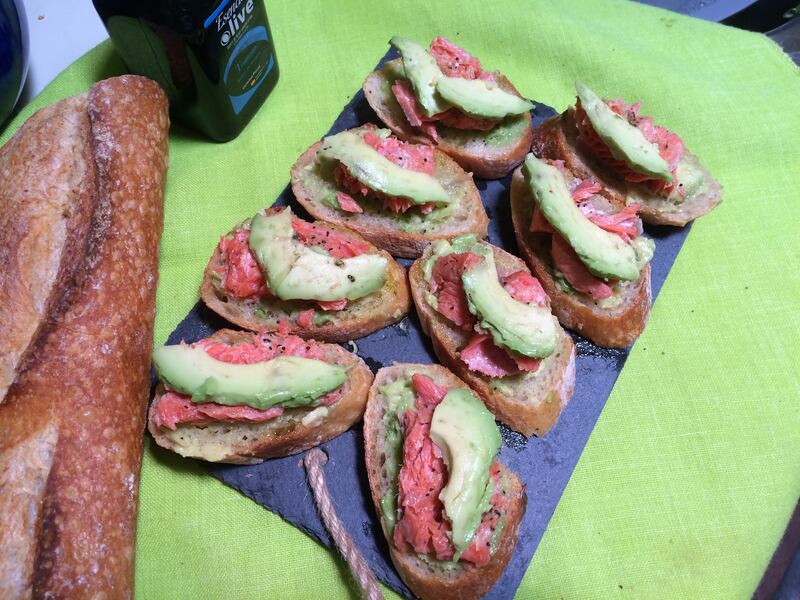 You are in for a treat this summer–don’t wait until New Year’s Day feasting. If you have “black-eye-pea prejudice,” or if you have never tasted a FRESH black-eye-pea, read on! Black-eyes will be a reward for your palate–and positive reinforcement for the novice gardener. 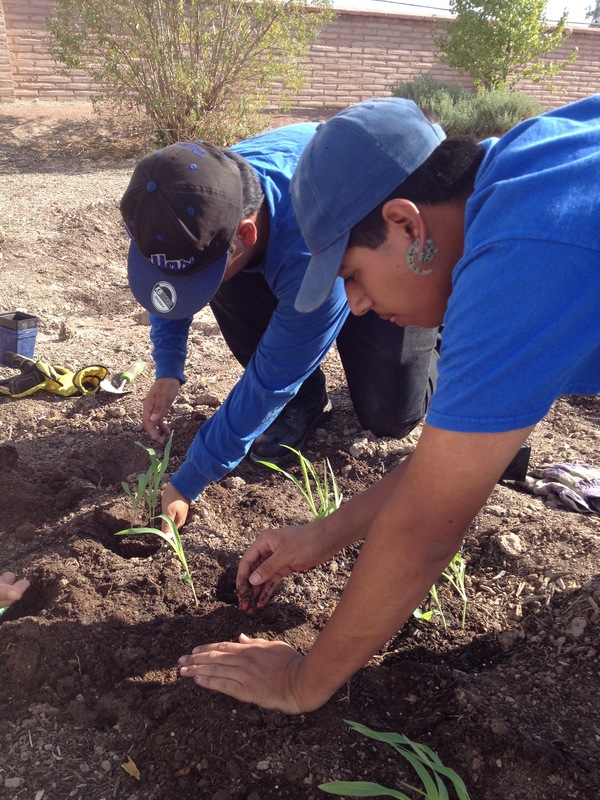 First, action is needed: With monsoon moisture it is time to get those seeds in the ground! 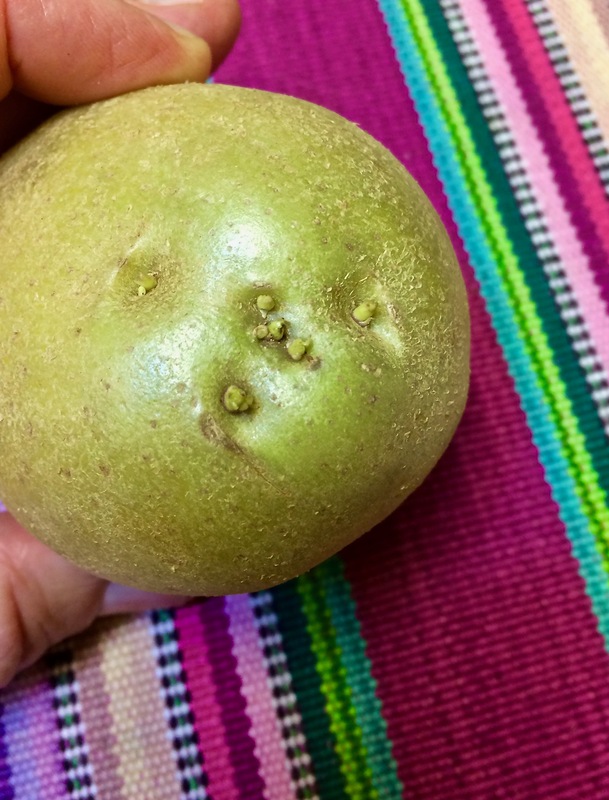 Tia Marta here to share some hot-weather garden advice, recipe inspiration, with some historical spice, about the sweet and nutritious black-eye “pea” Vigna unguiculata. A rose by any other name…..Really it’s not a pea at all! 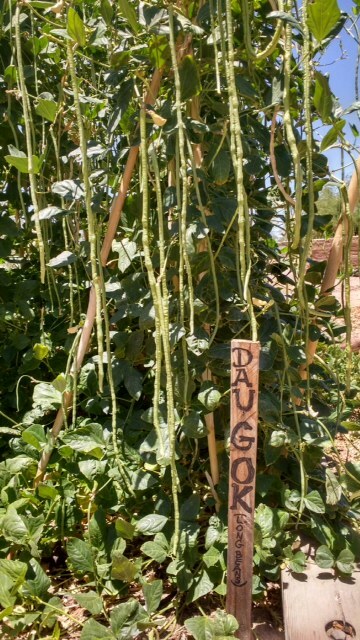 (Here in Baja Arizona, true peas, English peas, Pisum sativum, must be planted in the cool season.) Nor is black-eye a common bean either. 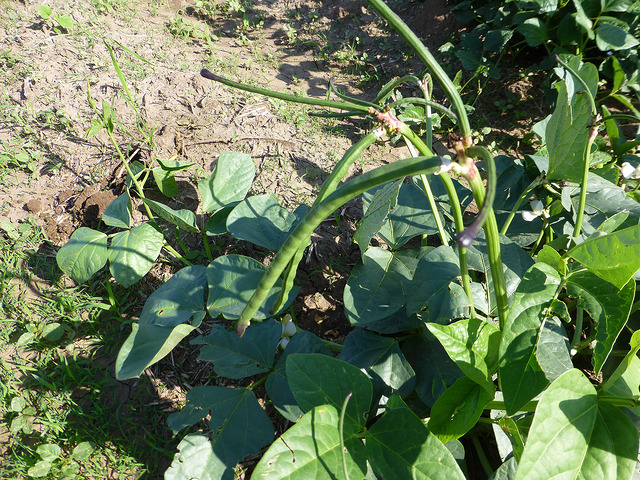 Other monikers for this frijol-like legume are cowpea (it used to be cow forage), and crowder pea (its fat seeds are packed against each other in the pod.) Spanish called them frijoles de carete. 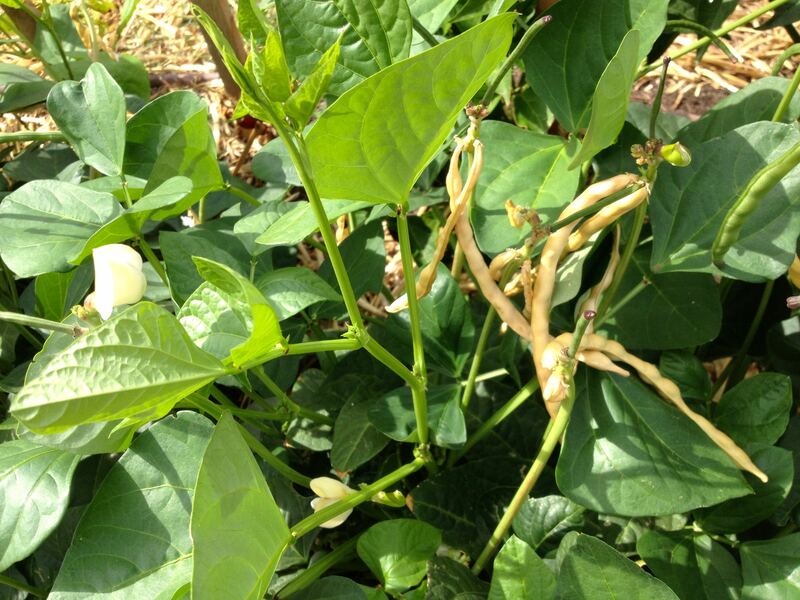 Cowpea varieties that became part of Chinese cuisine are called long beans. The generic term for edible legumes including cowpeas is pulses, a term that nutritionists tend to use. 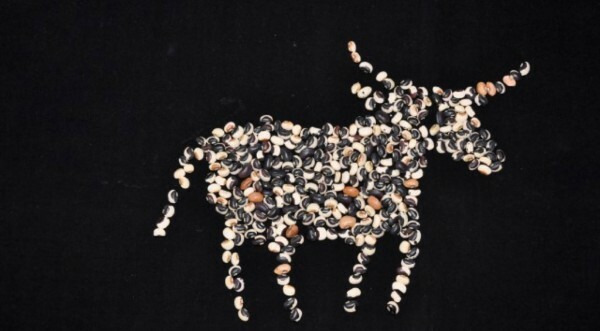 Cowpeas were first domesticated in sub-Saharan Africa a few thousand years ago and made it on their agricultural-culinary odyssey to Spain during the Middle Ages, according to historian William Dunmire. Cowpea came to the New World with Spanish explorers and arrived in the American Southwest with Padre Kino around 1706 (according to Bolton’s 1948 translation of Kino’s journals.) Native People of what is now northwest Mexico and the US Borderlands quickly adopted this sweet, nutritious food. 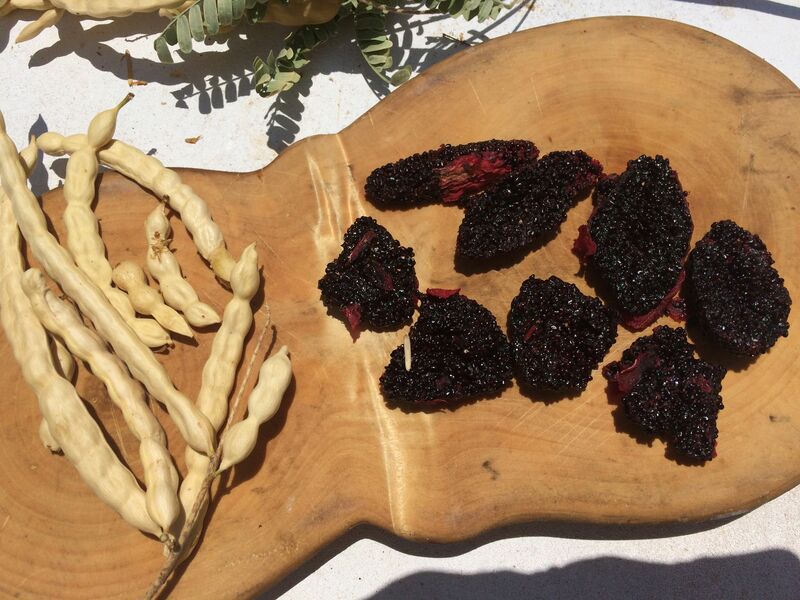 It dovetailed perfectly into their traditional summer temporal gardens, their bean staples, and their taste buds. 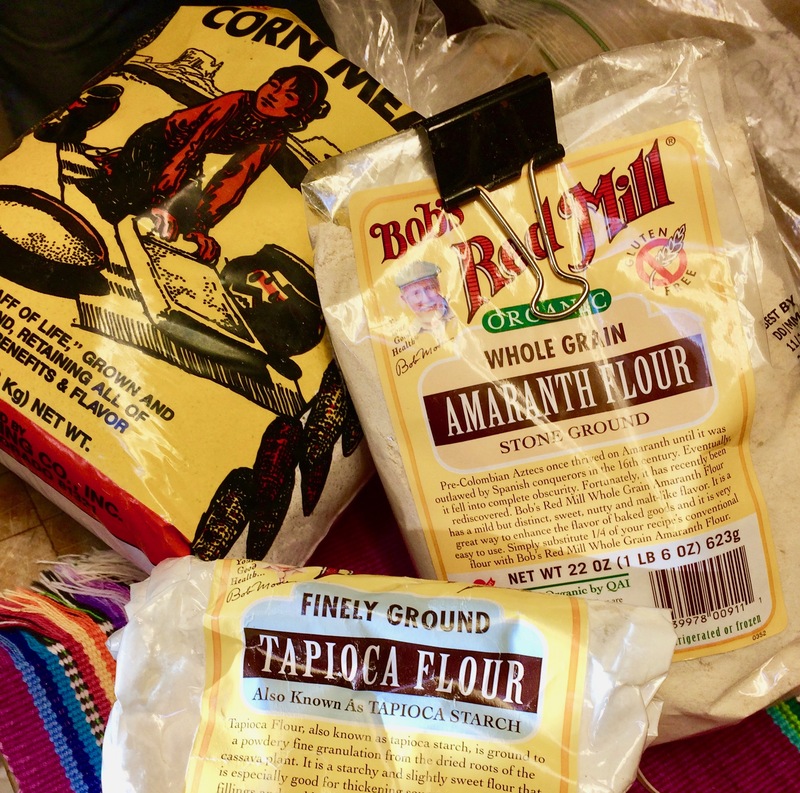 Over years of selection for color, flavor, and adaptation to arid agriculture, the Mayo, Pima Bajo, Tarahumara and other Native farmers shaped this Old World gift into different colorfully-patterned landraces. 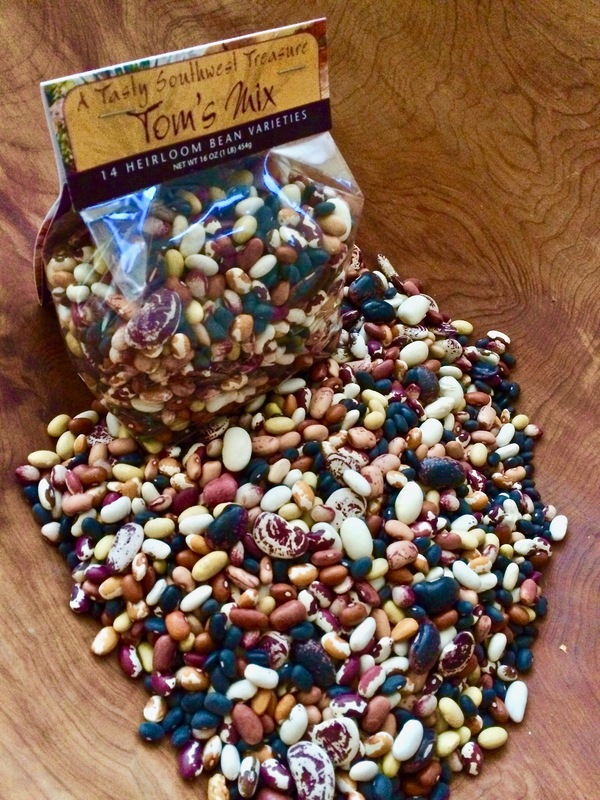 The Tohono O’odham, with selection, altered their adopted variety into a spotted vivid black and white bean, naming it U’us Mu:n or “sticks-bean” because the pods are long, straight or curvy, and clustered. 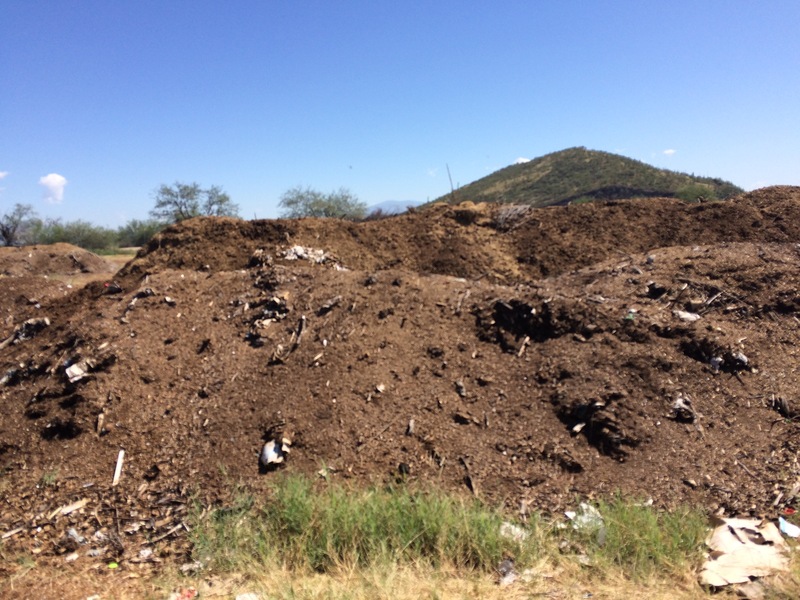 The Guarijio and Mountain Pima (now of Sonora) named theirs Yori Muni meaning “foreigner’s bean” as yori is slang for something akin to “gringo.” (Names can reveal alot.) 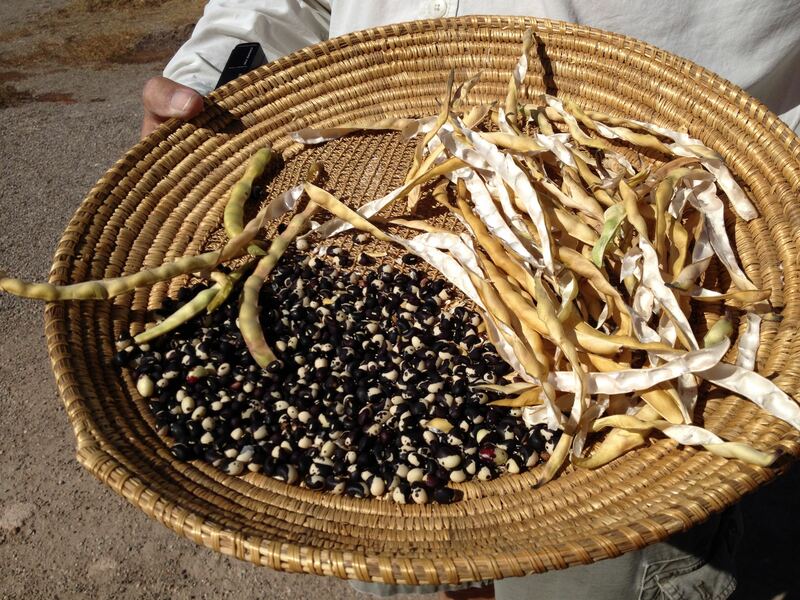 Mexican and Anglo pioneers and later African-Americans continued to bring “new” varieties of black-eye peas into the Baja Arizona borderlands–which all thrive in our humid hot summers. 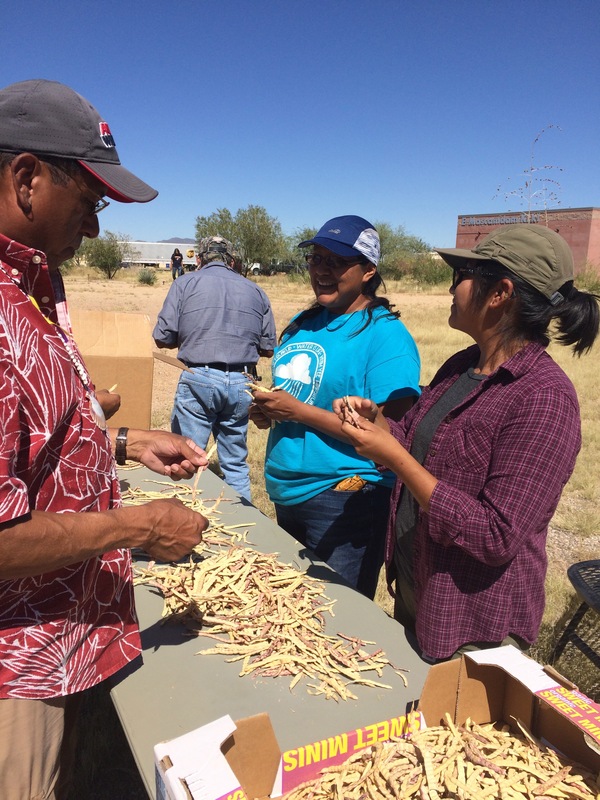 Your monsoon garden is bound for success choosing from NativeSeedsSEARCH’s many heirloom cowpea varieties –known success stories in the Southwest. 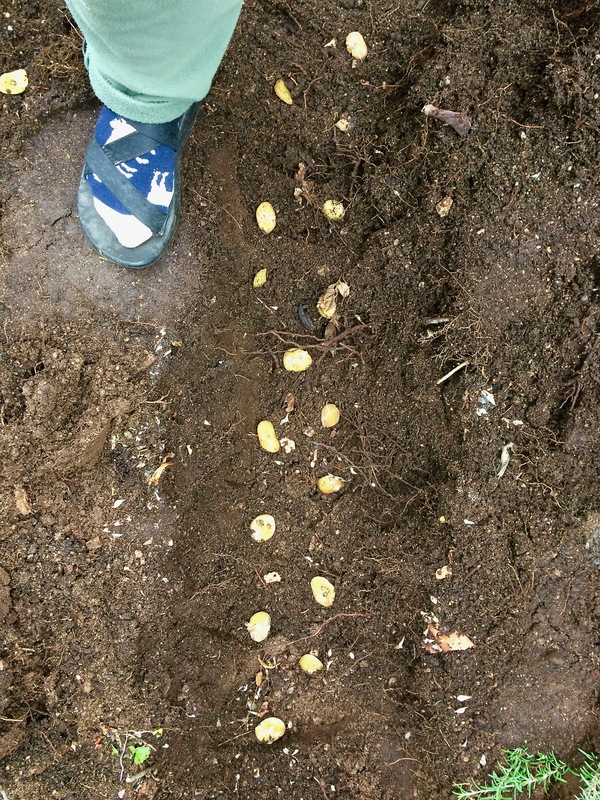 The seeds will be up in no time and flowering, great for gardening with kids. 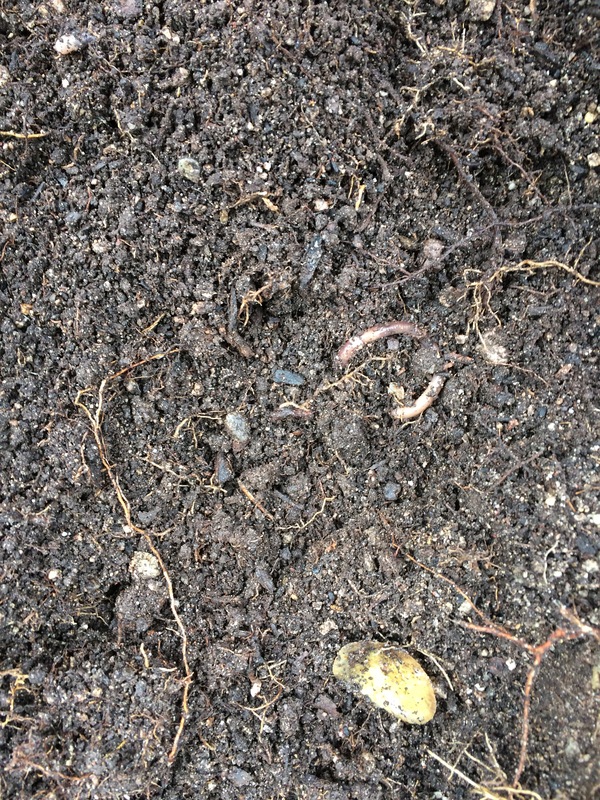 Down below soil level cowpea roots will be feeding the earth with nitrogen. Above ground they feed us well. 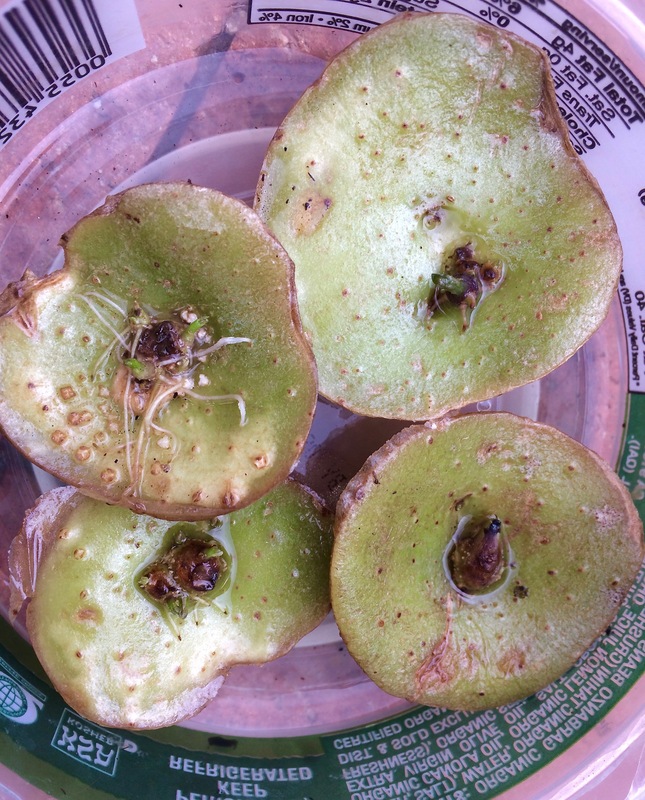 When pods are plump with seed, before they dry, harvest and cook the seeds fresh. When you taste fresh black-eyes your eyes will roll back in ecstasy as your tummy goes “whoopee!” After they dry, they can be kept for months, even years, but New Year’s is a good time to share them for good luck. 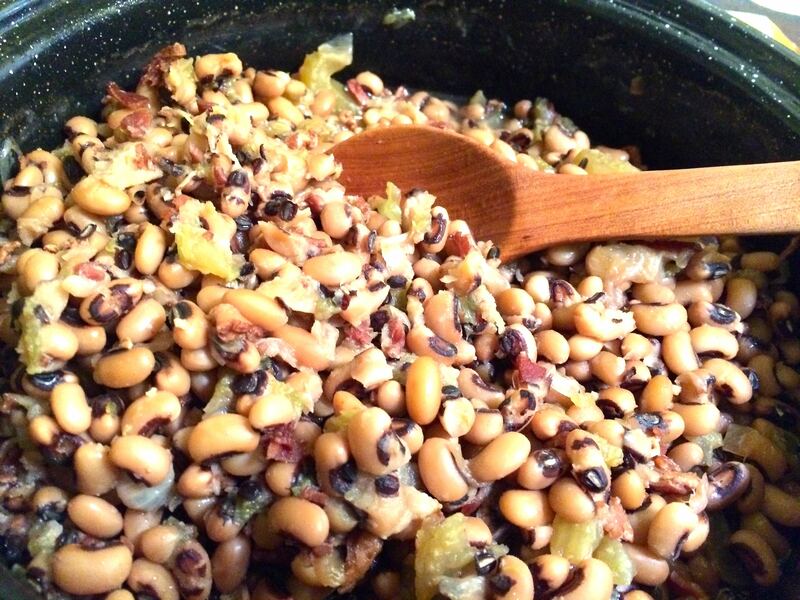 My favorite dish is a simple compote of cowpeas with garden vegetables. 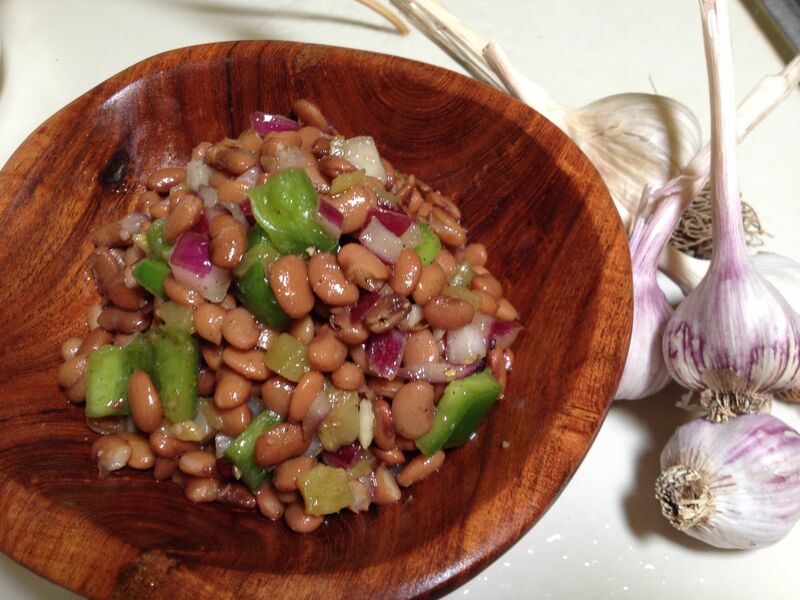 As cooking beans goes, cowpeas are much speedier than common beans, as they do not need to be presoaked, although soaking an hour before cooking does reduce cooking time. 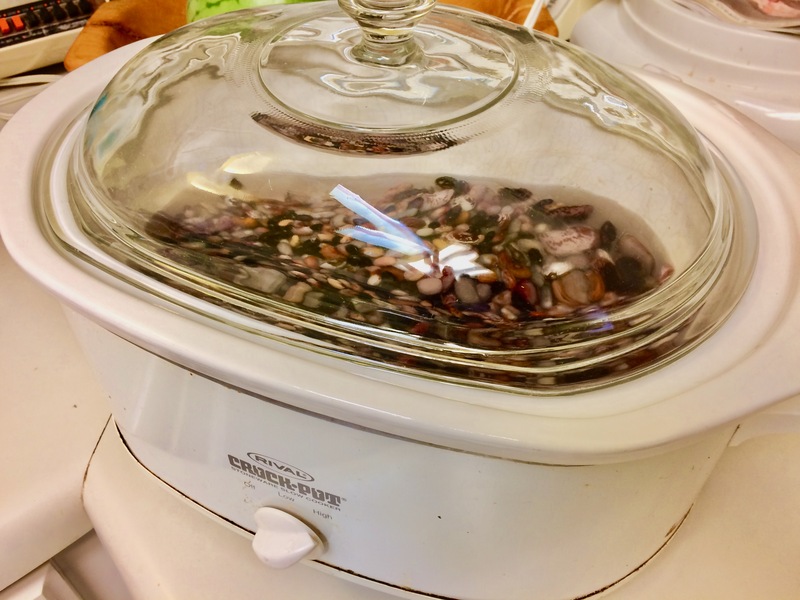 I quick-sauté my onions, garlic, carrots and celery in a little olive oil, add them to cowpeas and soak-water in a dark lidded saucepan, and put them in the solar oven. They will be done and smelling delightful in 2-3 hours, depending on the summer or winter sun during the brighter time of day. 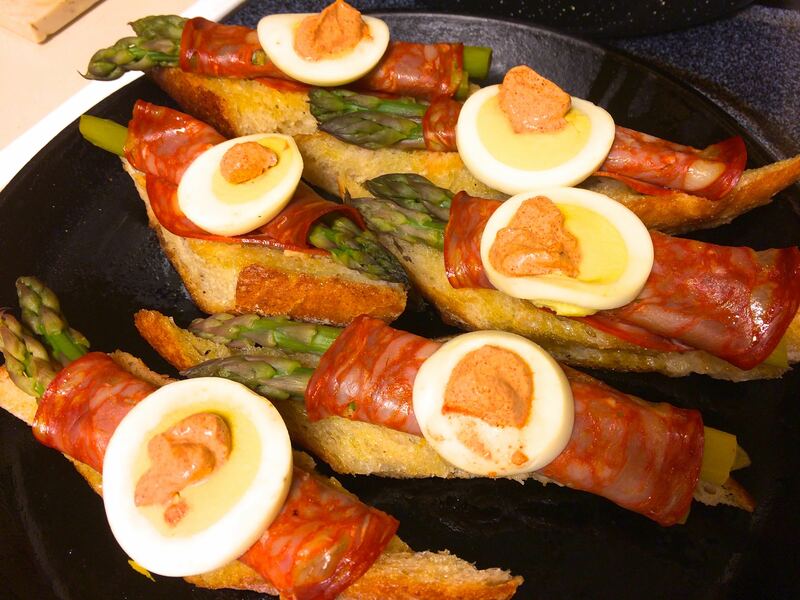 You can also make a hummus with black-eyes for a cool summertime dip. We grew a red cowpea heirloom from NativeSeedsSEARCH one summer that had foot-long straight pods. The refreshing green mass of foliage, flowers and pods sprawled across the garden and kept producing for weeks. 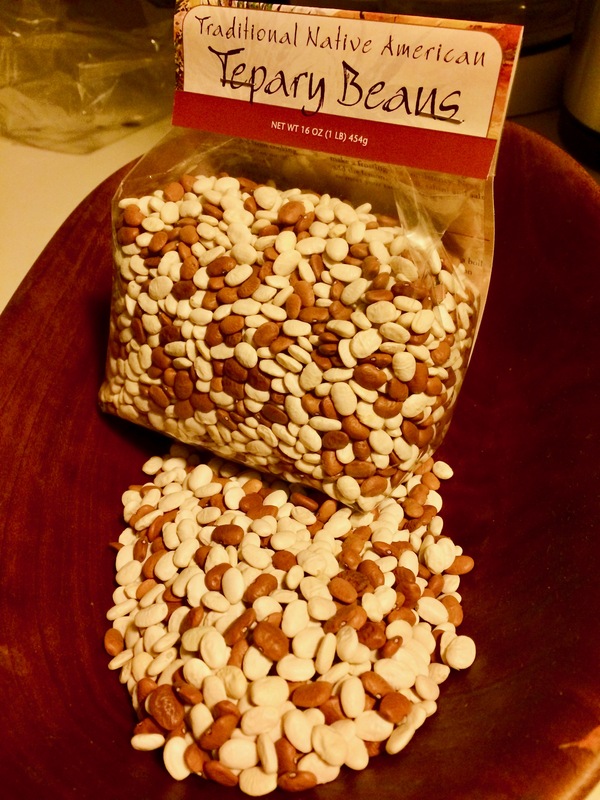 For a rainbow of cowpea ideas for your garden, go to www.nativeseeds.org, click on shop then enter cowpeas in the search box, or go directly to the NativeSeeds/SEARCH store, 3061 N Campbell and browse for instant gratification. 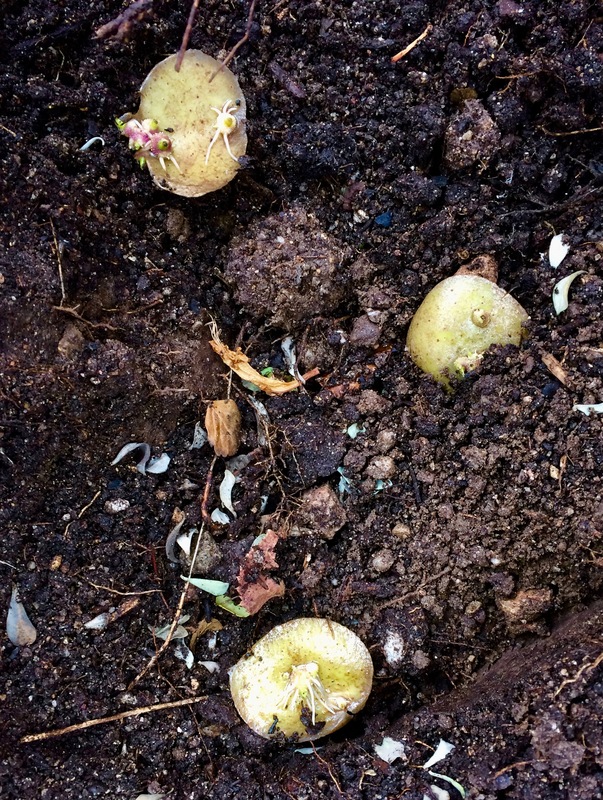 Prep your soil, pop seeds in the ground, add water and get ready for botanical action. 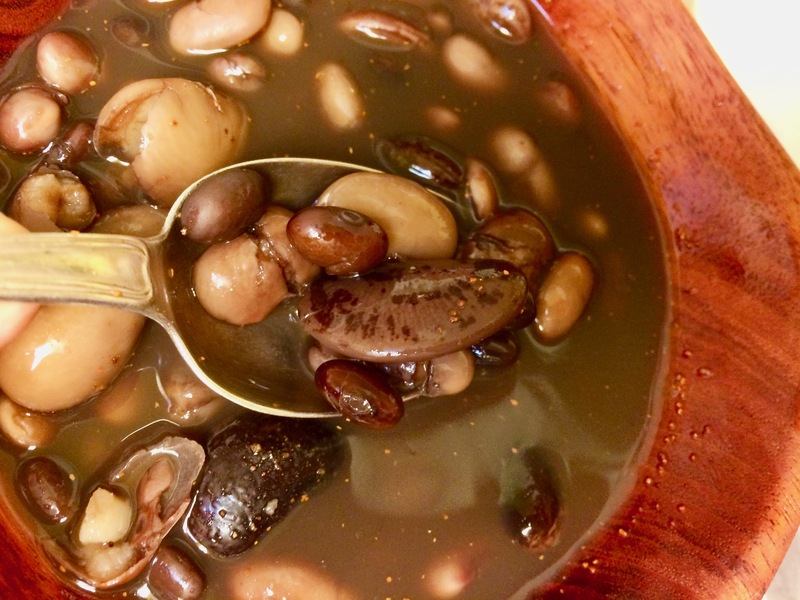 By late August you will be pleasing palates with your own home-grown cowpeas, black-eyes, crowders, u’us mu:n–fabulous food by whatever name you want to give them! 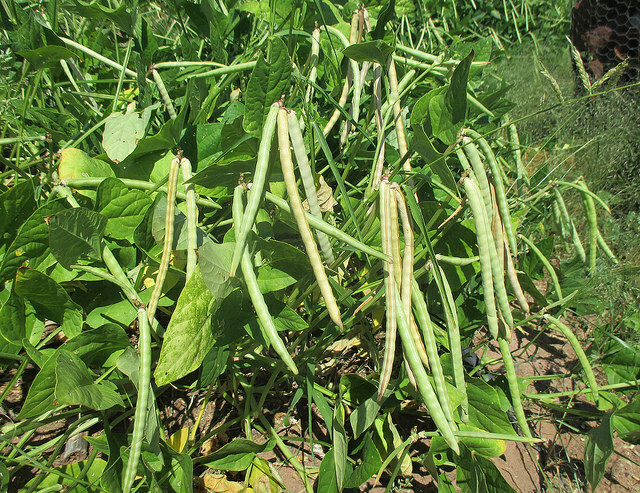 Savor Sister Jacqueline Soule discusses growing beans in our area on her site, Gardening With Soule here. 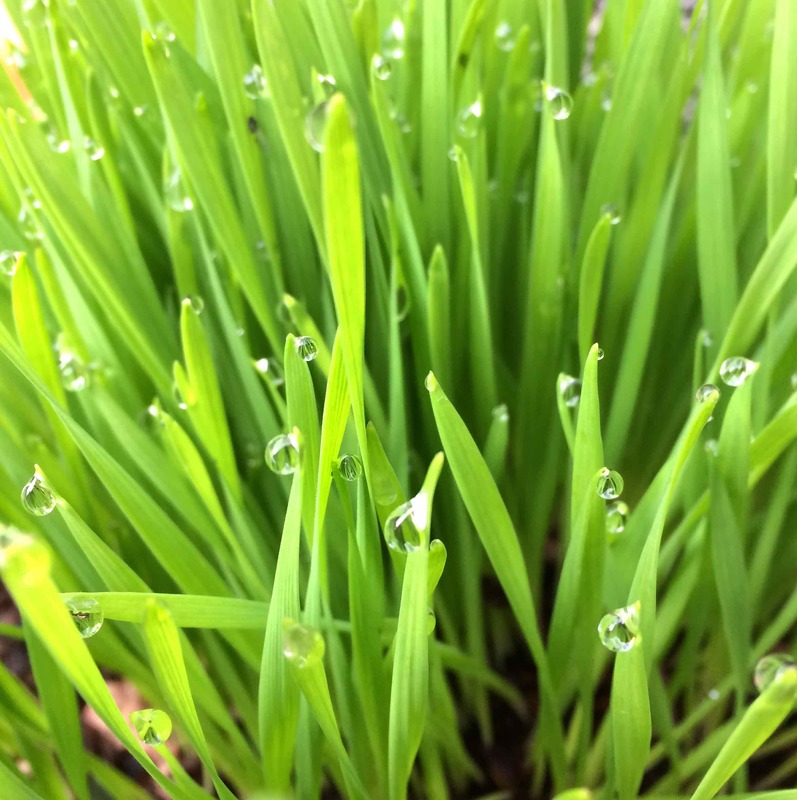 Can you hardly wait to have such greenery and goodness in your garden? 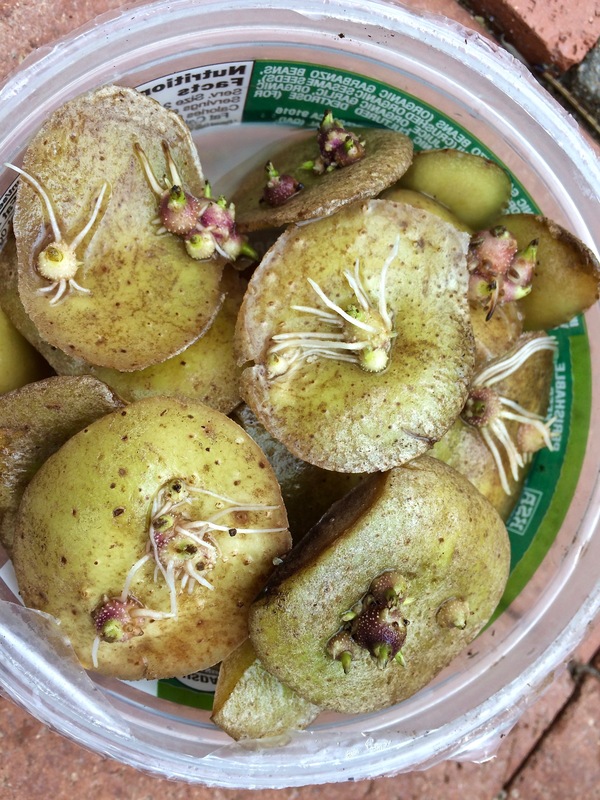 All it takes is some seeds in the ground! You can find even more detailed info about cowpeas at the NativeSeedsSEARCH blog and scroll down to May 14, 2018 post. Tia Marta wishing you happy and prolific gardening with the monsoons! 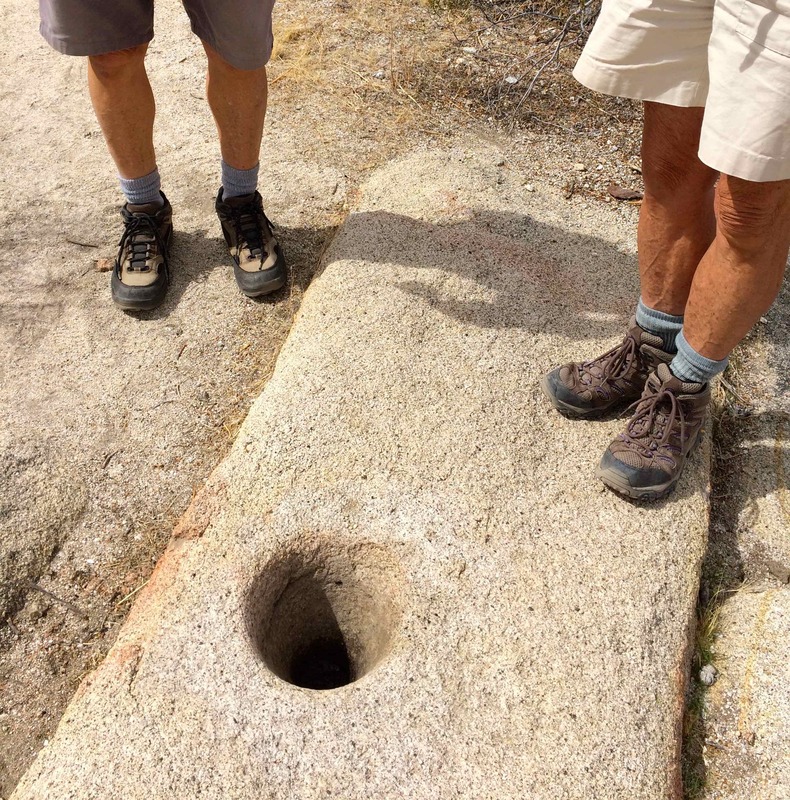 June in Baja Arizona should officially be Solar Cookery Month– time to not add any more heat in the house. Thanks to some fabulous Baja Arizona “solarizers,” namely Technicians for Sustainability (www.TFSsolar.com), our house is now blessed with a PV array–yet despite this “free” electricity we still don’t want any extra BTUs loose in the kitchen. Tia Marta here encouraging you to take your cooking OUTSIDE!! 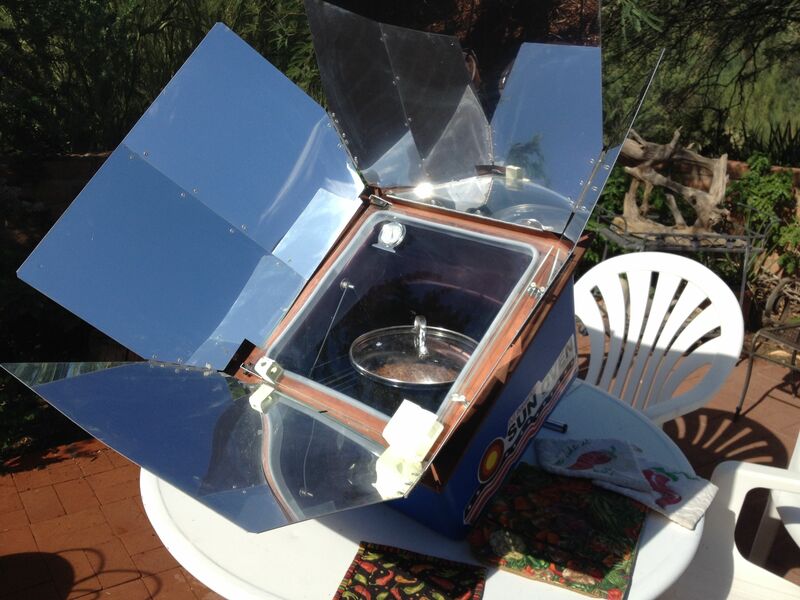 A great project to do with kids is to make your own solar oven with a cardboard box and lots of tinfoil. (The internet has easy do-it-yourself plans.) 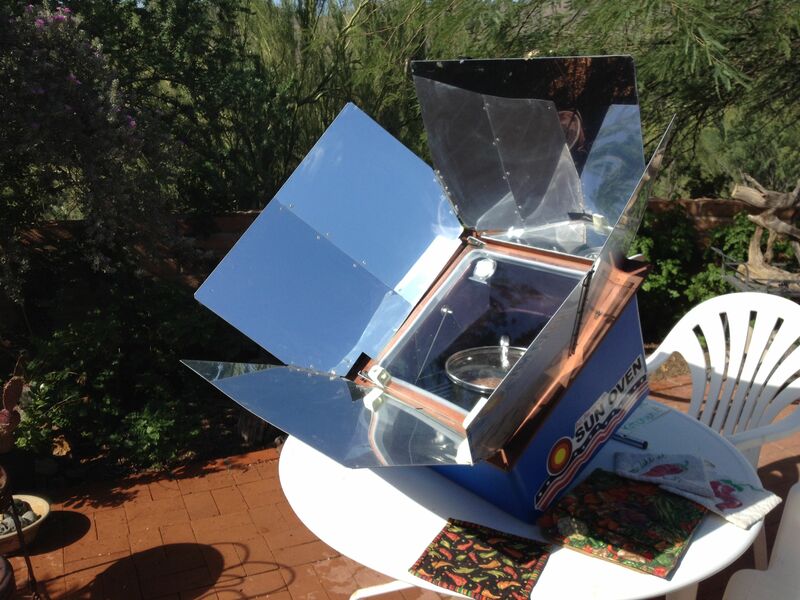 Or you can purchase a ready-made solar oven online. Check my website http://www.flordemayoarts.com under the menu “Native Foods” to buy one of the most efficient and least expensive solar ovens you’ll find anywhere! Wild desert fruits and orchard fruits will be coming on aplenty, and when solar-dried, they make wonderful snacks and trail mix. As seasonal veggies come available in your garden or at farmers markets, you can slice and solar dry them for winter soups and stews. 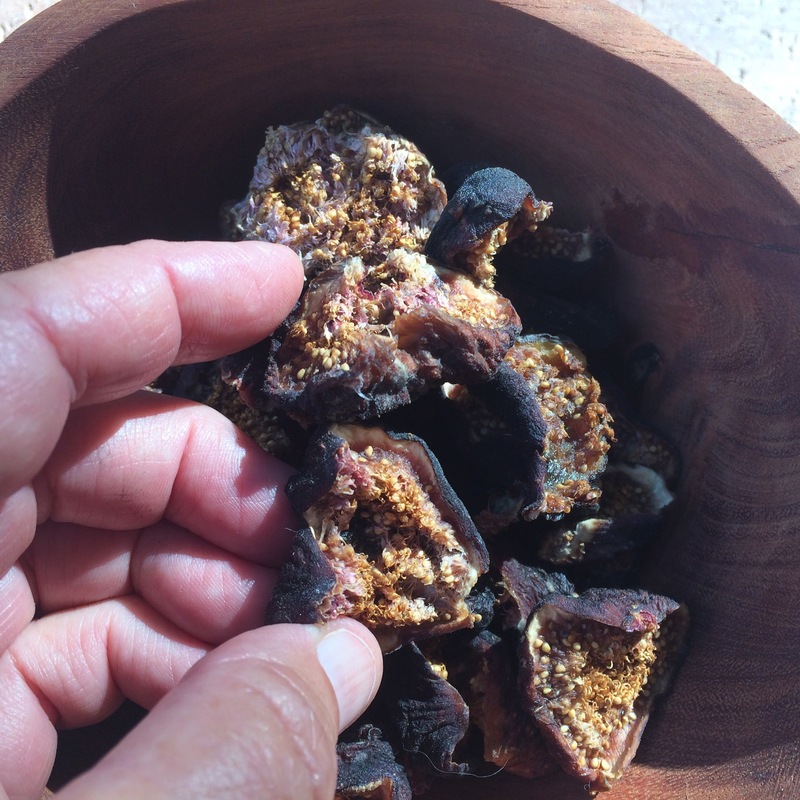 Pellet-sized fan-palm dates washed and ready to simmer for making “Datil Silvestre Syrup”–First they should be transferred with water to a dark pan with dark lid for placing in solar oven to absorb more heat. 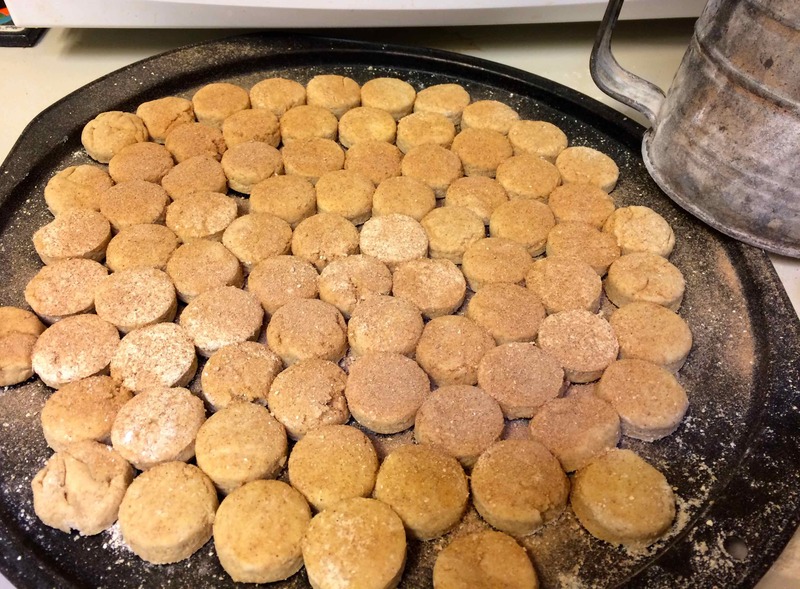 Scroll to Jan.30,2015 post for recipe. 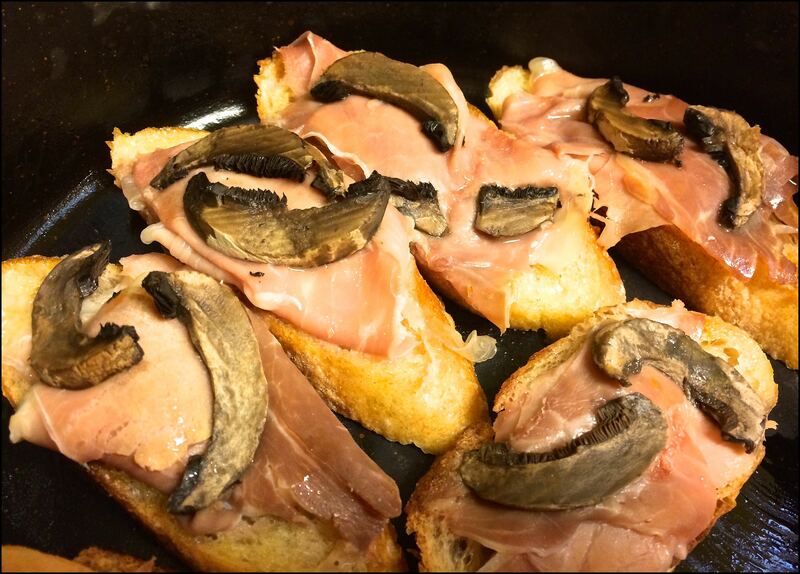 We cook such a variety of great dishes–from the simple to the complex– out on our patio table. I stuff and bake a whole chicken and set it in the solar oven after lunch. 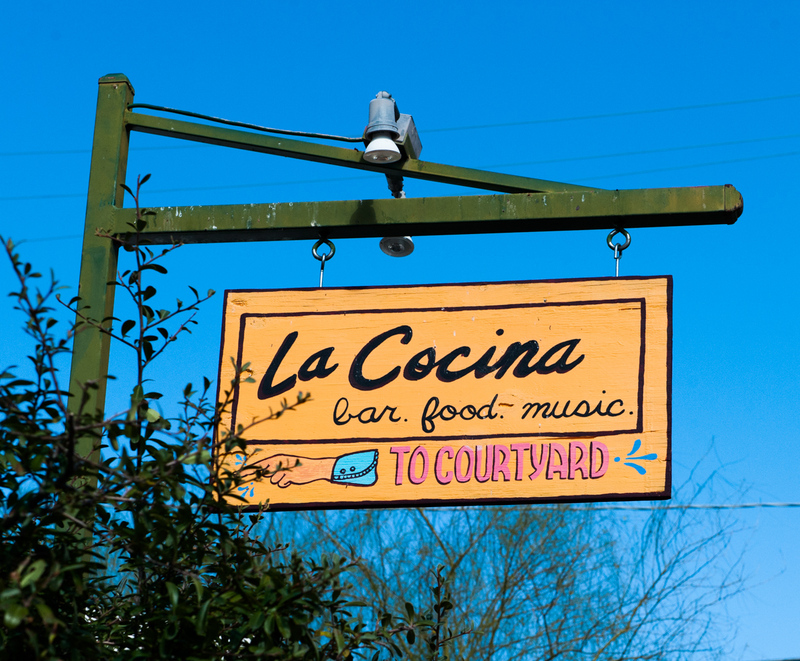 By suppertime, mouth-watering aromas are wafting from the patio. 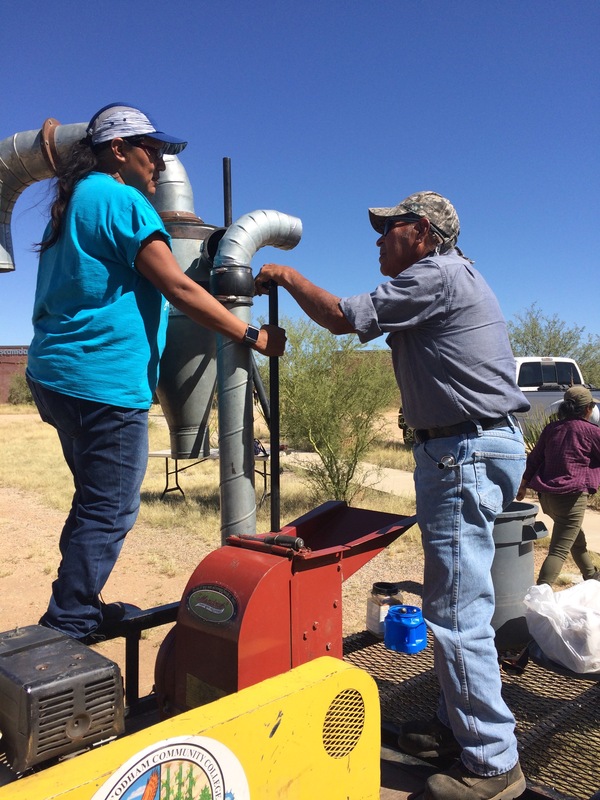 For fall harvest or winter dinners, I like to stuff an heirloom squash or Tohono O’odham pumpkin (Tohono O’odham ha:l) with cooked beans and heirloom wheat- berries to bake in the solar oven. It makes a beautiful vegetarian feast. 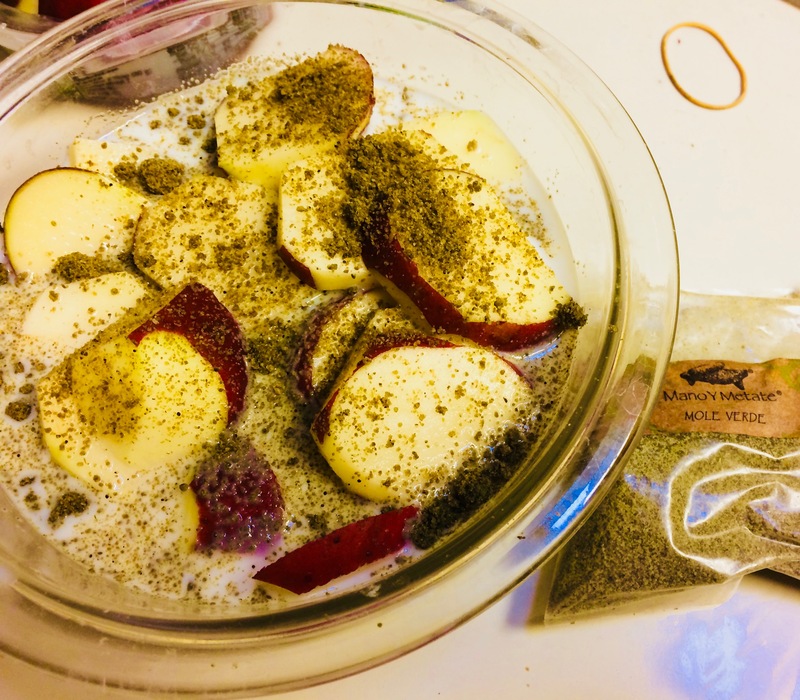 For one of my favorite hot-weather dishes–marinated White Sonora Wheat-berry Salad–the solar oven is a must. 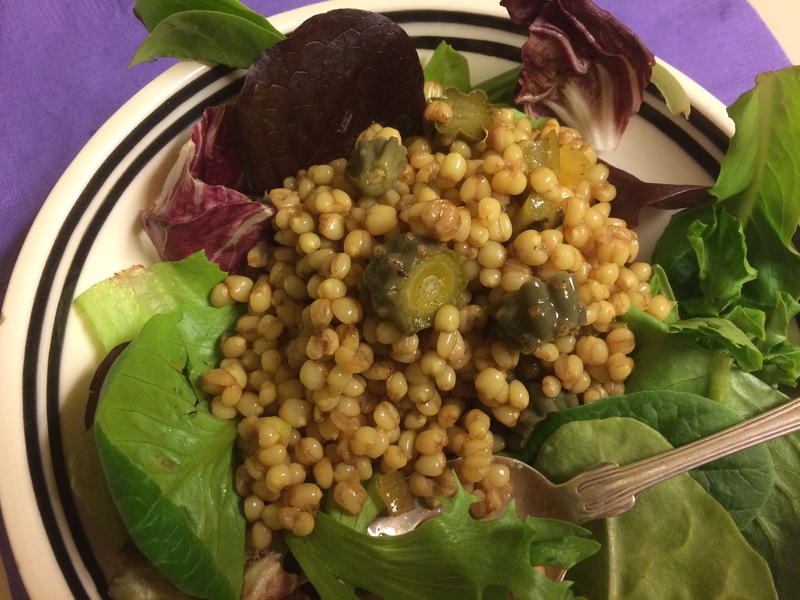 On stove-top, wheat-berries take an unpleasant hour20minutes to fully plump up. That’s alot of heat. Outdoors in the solar oven they take about 2 hours while the house stays cool, keeping humidity low. Hey–no brainer! 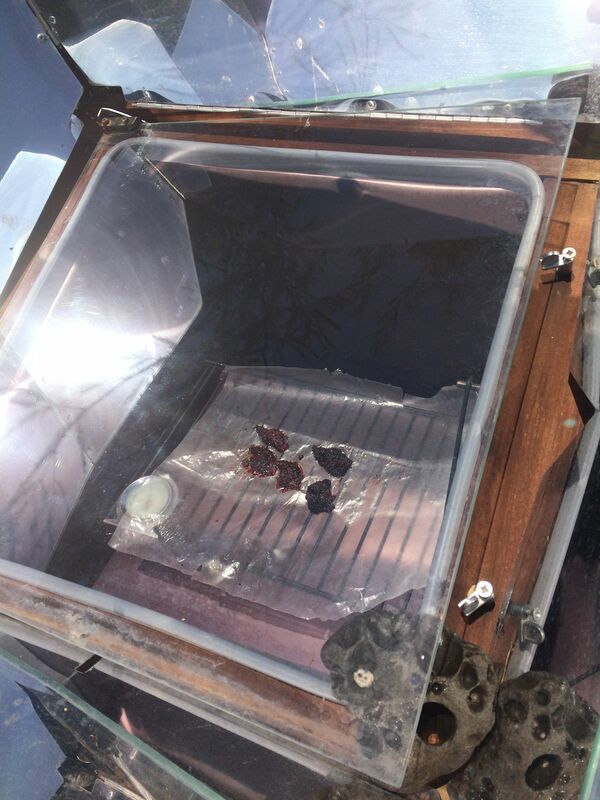 Simmer wheat-berries in solar oven until round, plump and softer than al dente, and have absorbed the water–approximately 2-2 1/2 hours depending on the sun. Drain any excess water. Chill in frig. 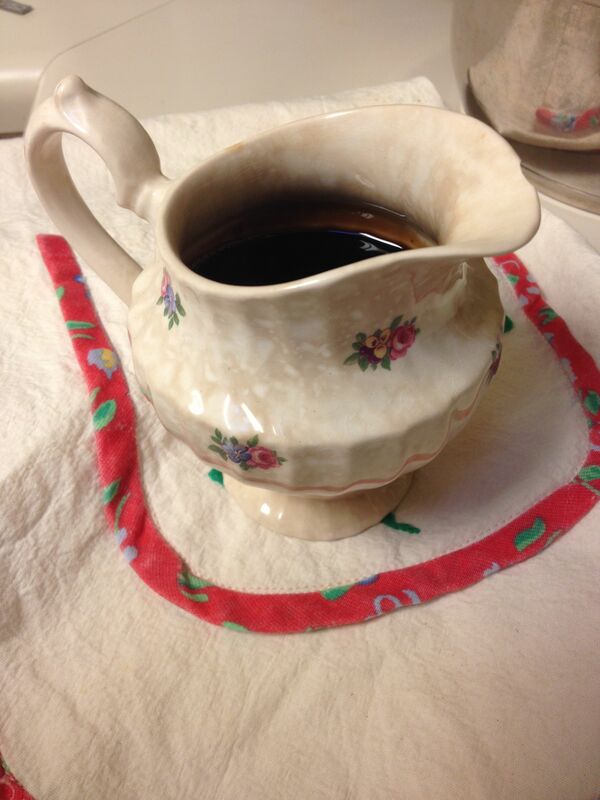 Marinate overnight with !/2 cup balsamic vinegar or your favorite citrus dressing. 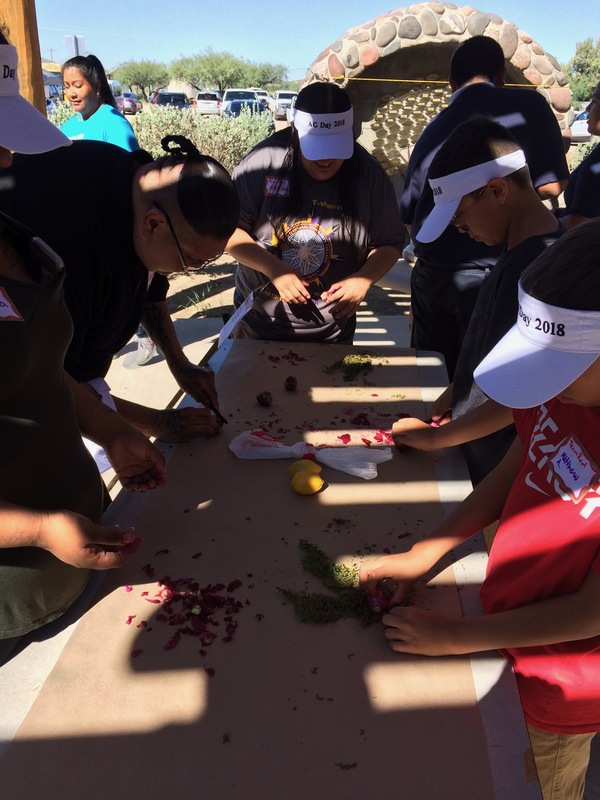 Add any assorted chopped veggies (sweet peppers, I’itoi’s onions, celery, carrots, pinyon nuts, cholla buds, barrel cactus fruit, nopalitos….). 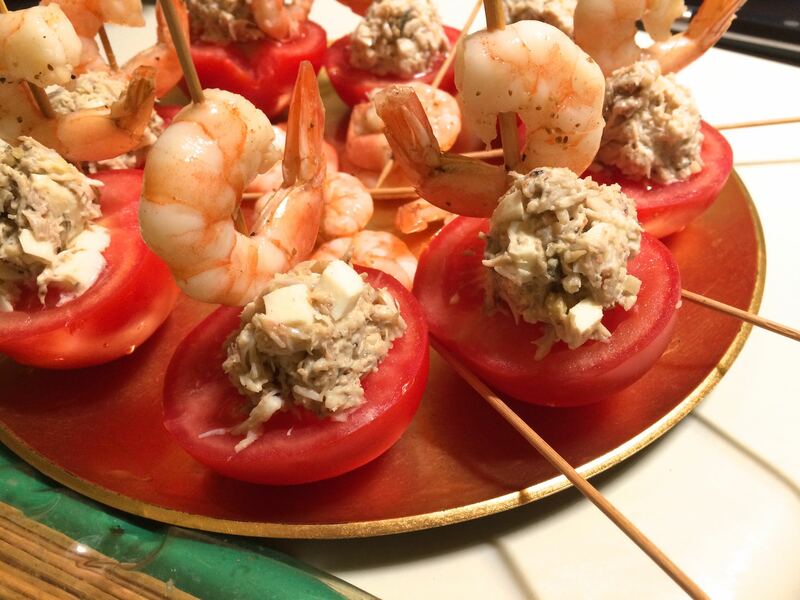 Toss and serve on a bed of lettuce. 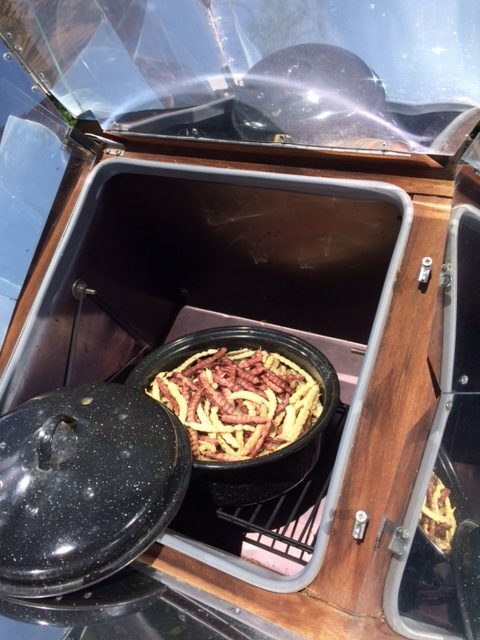 While cooking with a solar oven, it will help to “visit” your oven every 1/2 hour or hour to adjust the orientation to be perpendicular to the sun’s rays. Think about it–You gotta get up that frequently anyway from that computer or device where you’ve been immobile–just for health and circulation’s sake! 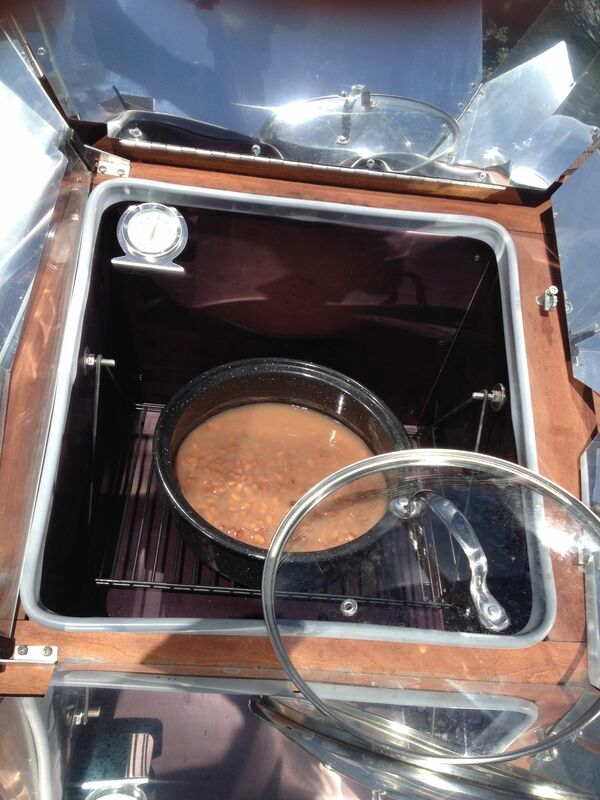 Think of your solar oven as part of your wellness program. A solar oven is so forgiving too. If you need to run errands, just place the oven in a median position to the movement of the sun. Cooking may take a little longer, but, you are freed up to take that class, get crazy on the internet, texting or whatever. And if you should get detained, good old Mr. Sun will turn off your oven for you. No dependency on digital timers. 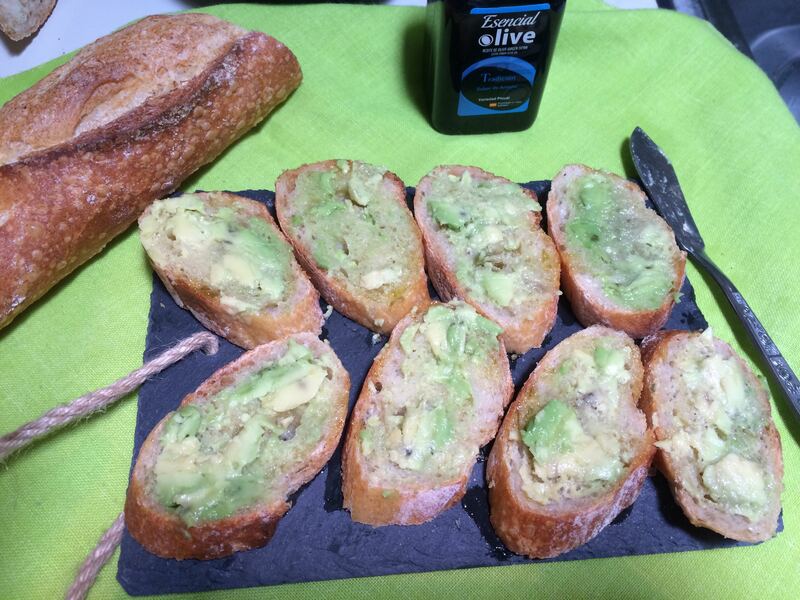 Happy cooking with the sun this summer! Boughs are hanging heavy with fruit in the Mission Garden’s living history orchard at the foot of A-Mountain! 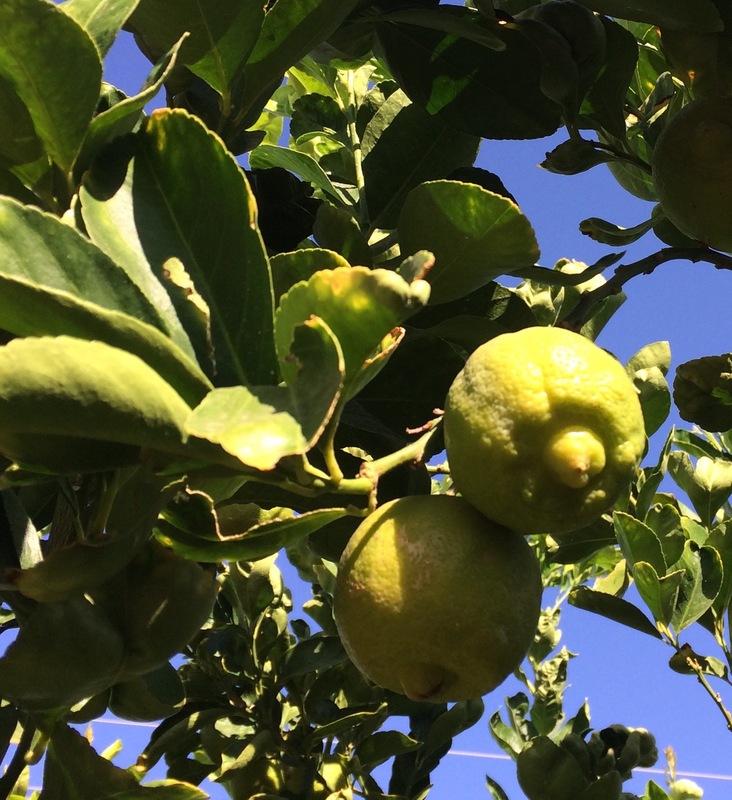 With chilly nights at last descending upon us, it is time for all of us in low desert country to harvest citrus for the holidays. 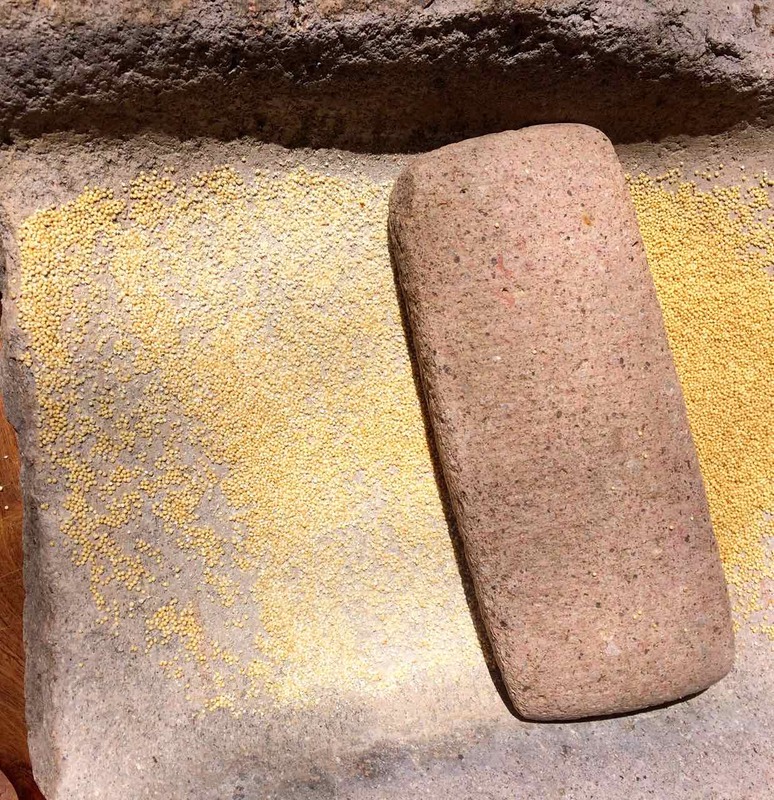 The heirloom SWEET-LIME, brought by Father Kino to the Pimeria Alta more than 3 centuries ago, is a living, lasting gift to us, conserved and propagated now by ethnobotanist Jesus Garcia of the Arizona-Sonora Desert Museum and the Kino Mission Fruit-tree Project. Citrus time again in Baja Arizona! 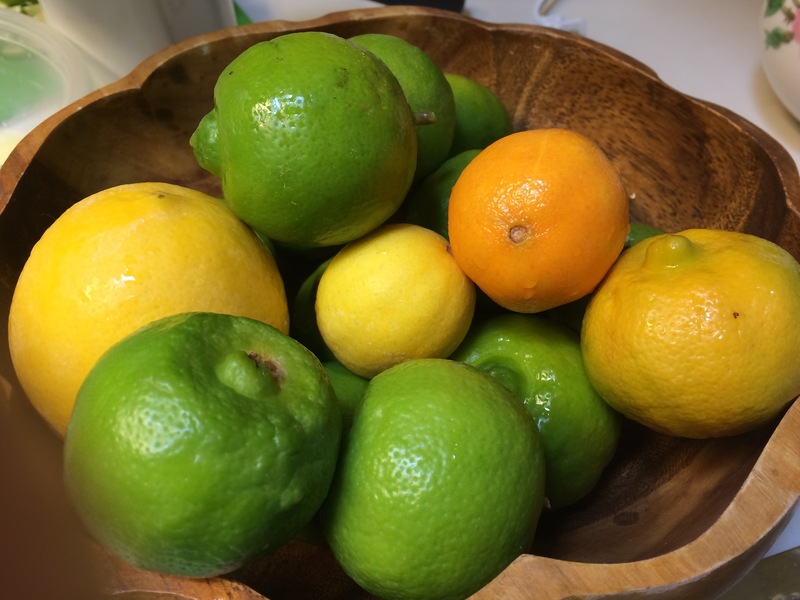 I’ve harvested Meyer Lemon, Mexican lime, and tangerine from my trees, and I hope to buy an heirloom sweet-lime from Mission Garden to plant in mi huertita–my mini-orchard. 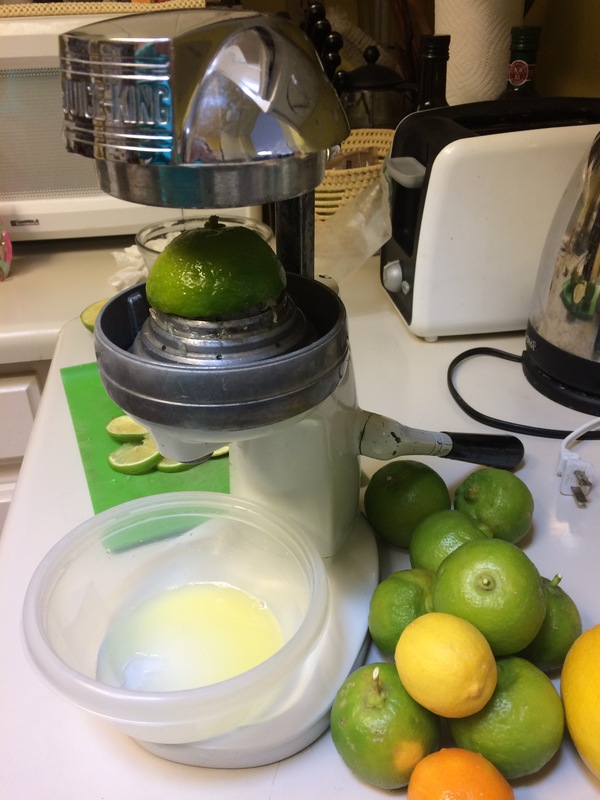 It’s easy to juice sweet-limes in a manual squeezer. 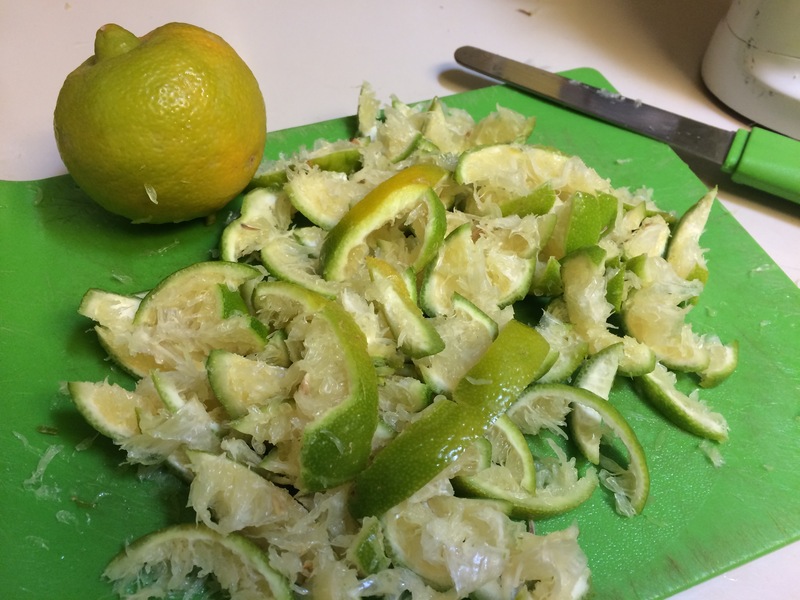 Ideas for sweet-lime juice: Amazing what baby-boomers are getting rid of these days. I found a manual juicer at a yard sale which is perfect for citrus halves and even for sections of pomegranate. With sweet-lime juice you can wax creative. 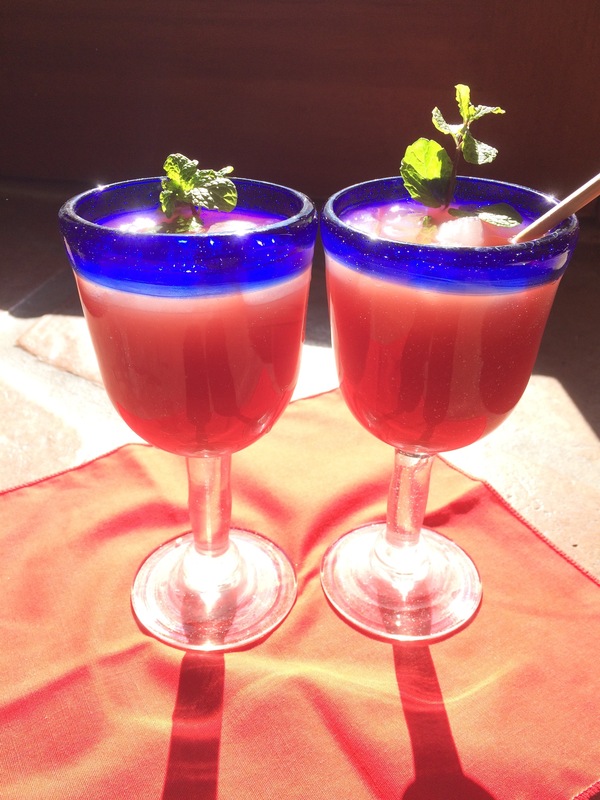 For a festive punch, try it mixed with prickly pear juice that you have saved frozen from your August harvest. Or, for more colorful punches, mix sweet-lime juice with grenadine, or your home-squoze pomegranate juice, or jamaica tea. 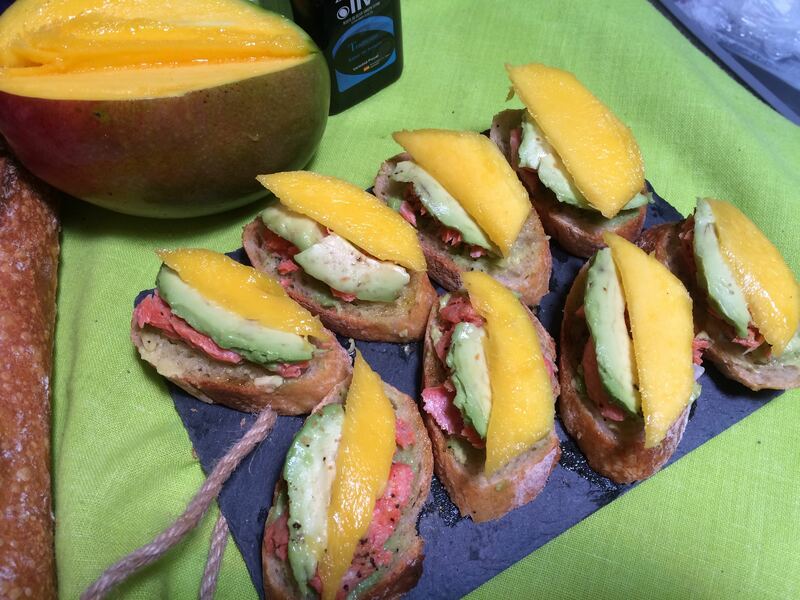 It also tastes great with mango. Another admired Tucson ethnobotanist, Dr Letitia McCune, (www.botanydoc.com) is an expert in cherry nutrition so of course I had to try sweet-lime with tart cherry. Yum! Sweet-lime juice and tart cherry punch–a glass full of flavor and colorful cheer for the holidays! 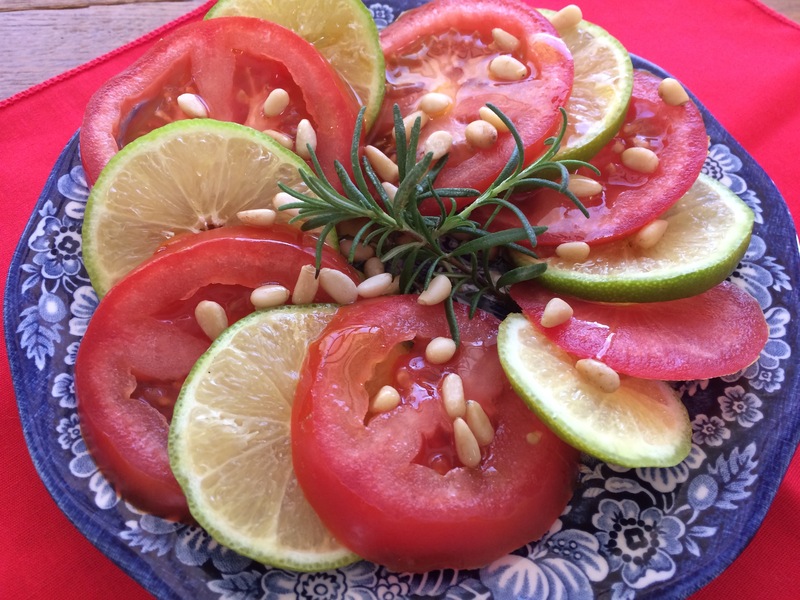 Sweet-lime, sweet sliced tomato, and rosemary Garni, topped with pine nuts and drizzled with olive oil. Peeled and diced sweet-lime fruit makes an incomparable aromatic addition to a fruit salad. 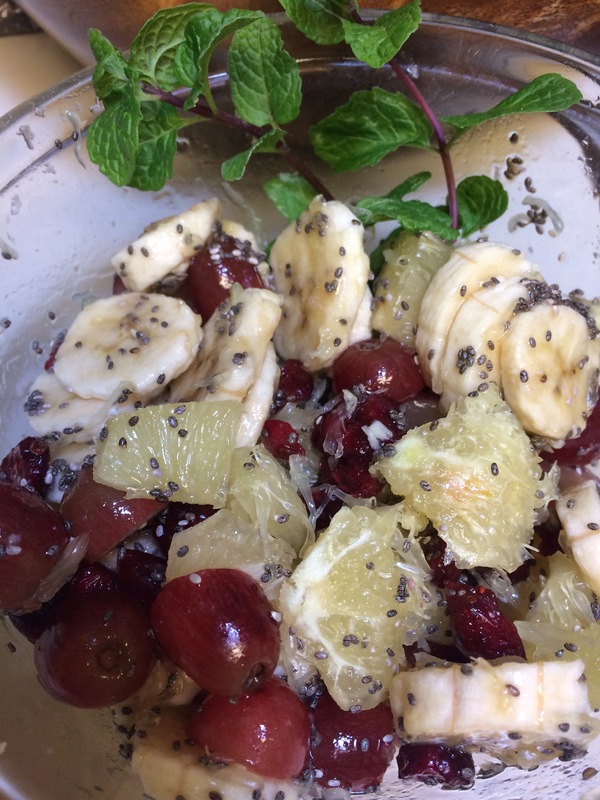 Here sweet-lime chunks are tossed with sliced red grapes and bananas, dressed with chia seed and agave nectar. 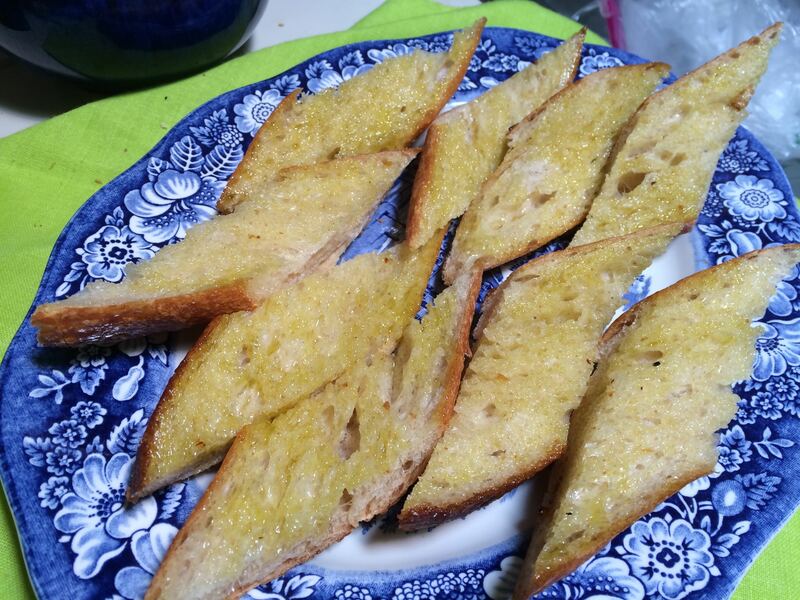 No need to throw away these fragrant sweet-lime rinds! Everything has a use. 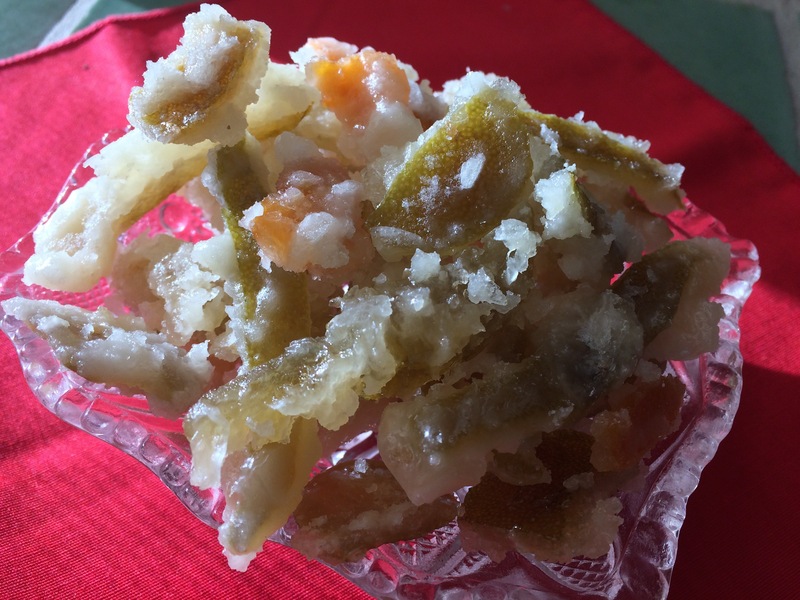 Crytallized sweet-lime and tangerine rinds make a marvelous home-made holiday candy. SWEET-LIME CANDY RECIPE: For a simple-to-make holiday treat of sweet-lime and other citrus rinds, boil sweet-lime rinds for 5-10 minutes to denature some bitter oils, drain completely, add equivalent amount of organic sugar (i.e. 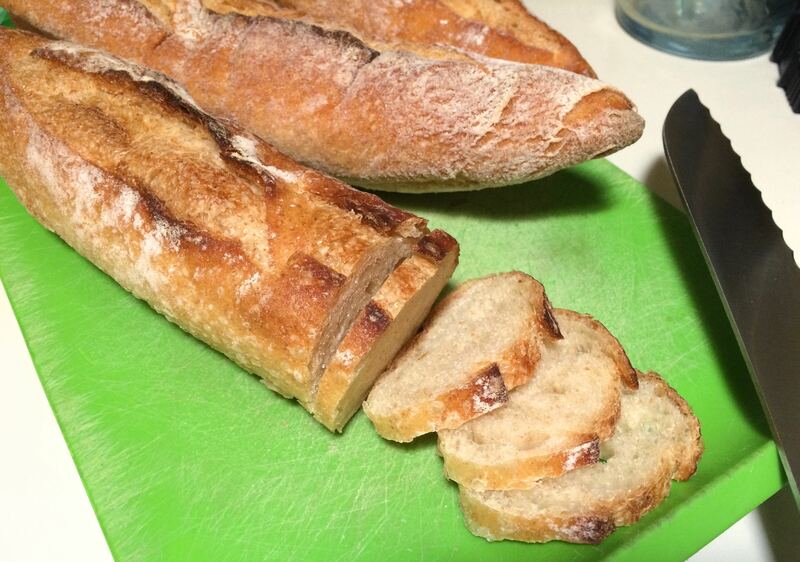 if you have 2 cups of sliced rinds then add 2 cups of sugar). Do not add ANY liquid. 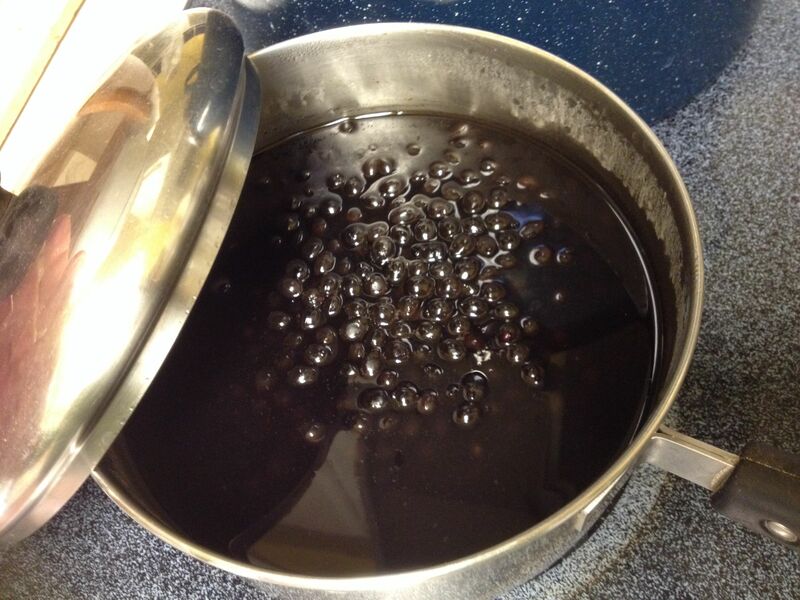 In saucepan, cook on medium heat until a thick syrup forms (at the hard-ball stage). 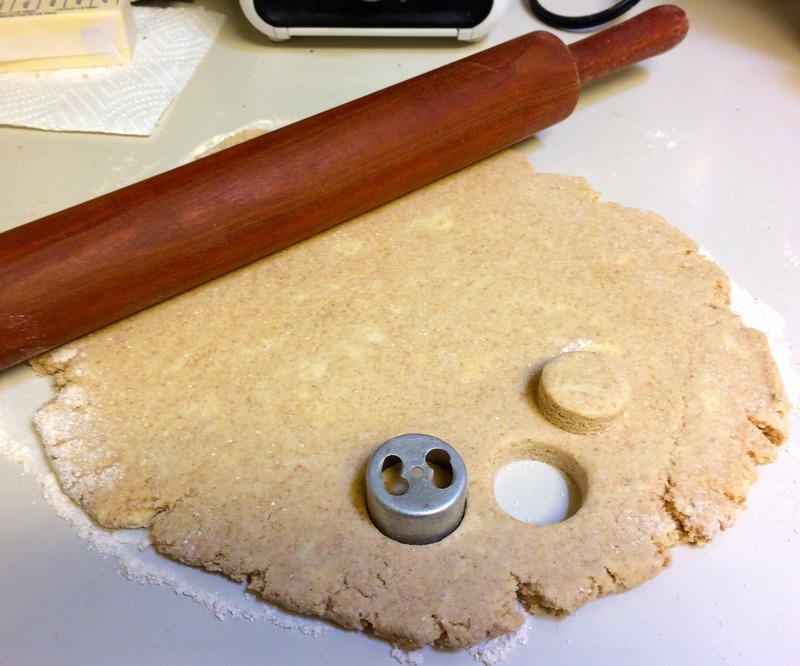 With tongs, remove each syrup-coated slice and place to dry and harden on a cookie sheet or waxed paper. 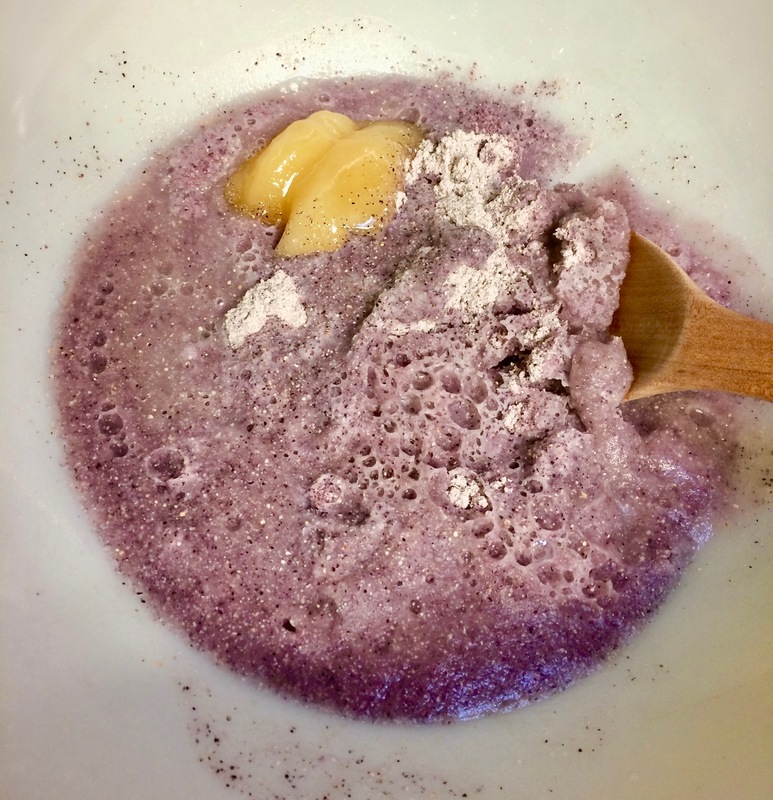 Each will crystallize into a crunchy piece of aromatic candy to excite both the youthful and mature palette. AN EVEN BETTER SERVING SUGGESTION: (Ah-hah!–You have already thought of this!) 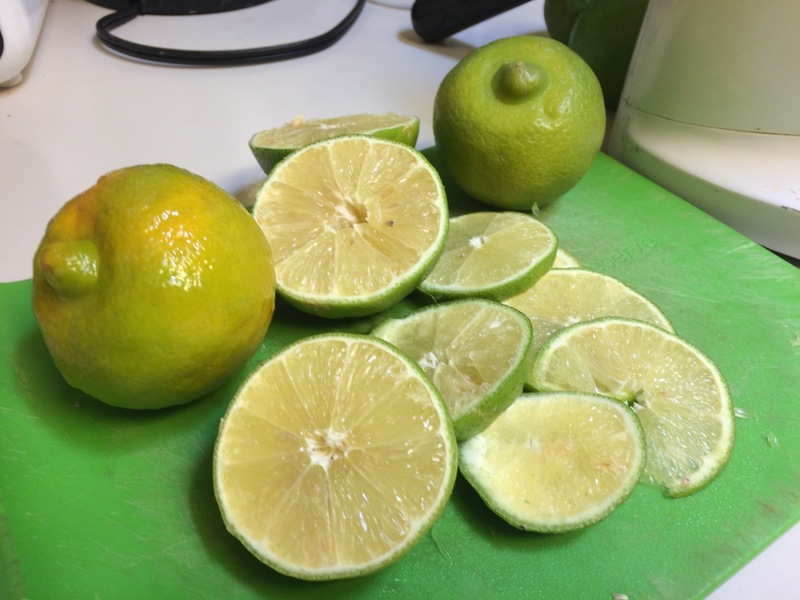 “Enhance” your punch into a fabulous SWEET-LIME MARGARITA by adding a jigger of your favorite local Bacanora, Sotol or mescal spirits to your sweet-lime punch. Then pow! 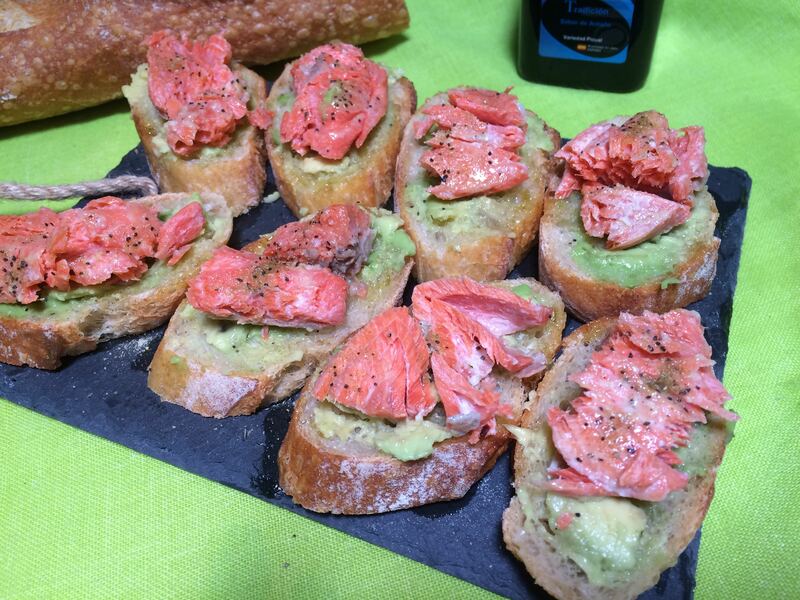 !–taste that “nutrition”! If you happen to add prickly pear juice, you even have a built-in hangover helper. Happiest holiday wishes to all! Wassail wassail as we hail the heirlooms!